ZFS on Linux lets admins error correct in real time and use solid-state disks for data caching. With the command-line interface, they can install it for these benefits. ZFS is a file system that provides a way to store and manage large volumes of data, but you must manually install it. ZFS on Linux does more than file organization, so its terminology differs from standard disk-related vocabulary. The file system collects data in pools. Vdevs, or virtual devices, make up each pool and provide redundancy if a physical device fails. You can store these pools on a single storage disk -- which is not a good idea if you encounter file corruption or if the drive fails -- or many disks. use of high-performance software rather than proprietary RAID hardware. ZFS on Linux offers significant advantages over more traditional file systems such as ext, the journaling file system and Btrfs. With ZFS, it is easy to create a crash-consistent point in time that you can easily back up. ZFS can also support massive file sizes of up to 16 exabytes if the hardware meets performance requirements. To install ZFS on Linux, type sudo apt-get install zfsutils-linux -y into the command-line interface (CLI). This example shows how to create a new ZFS data volume that spans two disks, but other ZFS disk configurations are also available. This tutorial uses the zfs-utils setup package. 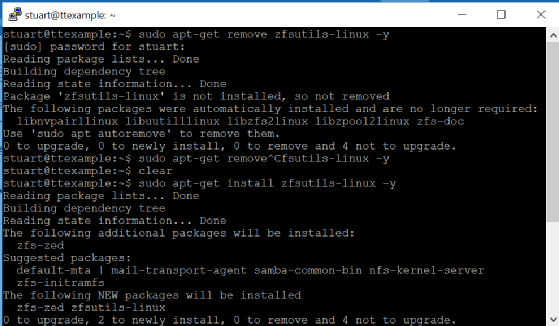 ZFS1: To start the installation process, type sudo apt-get install zfsutils-linux -y into the command-line interface. Next, create the vdev disk container. This example adds two 20 GB disks. To identify the disks, use the sudo fdisk -l command. In this case, the two disks are /dev/sdb and /dev/sdc. ZFS2: Use sudo fdisk -l to identify which disks you want to use for data storage. Now you can create the mirror setup with sudo zpool create mypool mirror /dev/sdb /dev/sdc. Depending on the disk reader's setup when you install ZFS, you might get an error that states "/dev/sdb does not contain an extensible firmware interface label but it may contain partition information in the master boot record." To fix it, use the -f switch so the full command is sudo zpool create -f mypool mirror /dev/sdb /dev/sdc. If you are successful, you won't receive an output or error message. To reduce root folder clutter, group the ZFS in a subfolder instead of in the root drive. At this point, the system creates a pool. 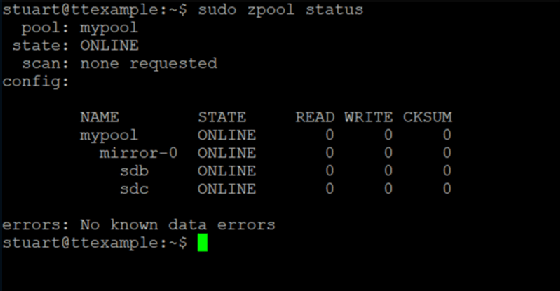 To check the pool's status, use the sudo zpool status command. The CLI will show the following status and the included volumes. Your pools should automatically mount and be available within the system. The pools' default location is in a directory off the root folder with the pool name. For example, mypool will mount on the /mypool folder, and you can use the pool just like any other mount point. If you're not sure of a pool location, use sudo zfs get all | grep mountpoint to show which mount point the program uses and identify the mount point needed to bring the pool online. ZFS4: One command in ZFS helps you identify which programs the mount point uses. With your data pools online, you can set most ZFS options via the CLI with sudo zfs. To set up more advanced ZFS functions, such as how to snapshot a read-only version of a file system, define storage pool thresholds or check data integrity with the checksum function, search the in-system ZFS resources with man zfs and reference the Ubuntu ZFS wiki. If you're new to ZFS, double-check commands before you run them and ensure you understand how they move data within pools, address storage limits and sync data. From the next major update to Windows 10 to the next generation of HoloLens, here's what's on tap from Microsoft this year. Click on a product above to jump to that section. April 5: Microsoft begins preparing all "fast ring" Windows Insiders to receive Windows 20H1 builds, and will begin testing Windows 10 19H2 "later this spring." April 4: Windows 10 19H1, officially called the "Windows 10 May 2019 Update," will reach the "release preview" stage next week, with general availability set for "late May," according to Microsoft. March 28: Windows 10 version 1809 is now approved for "broad deployment," Microsoft says. March 27: Test build 18865 of Windows 10 20H1 is released to Insiders. March 20: Windows 10 20H1 test build 18860 and 19H1 test build 18362 are released. March 19: Microsoft releases test build 18361 of Windows 10 19H1. March 15: Windows 10 19H1 build 18358 is released to testers. March 13: Test build 18855 of Windows 10 20H1 is released to Insiders. March 12: Microsoft releases Windows 10 19H1 test build 18356. March 8: Test build 18353 of Windows 10 19H1 is released to Insiders. March 6: Windows 10 20H1 test build 18850 is released to Insiders. March 5: Test build 18351 of Windows 10 19H1 is released. March 1: Microsoft releases test build 18348 of Windows 10 19H1. Feb. 28: Windows 10 20H1 test build 18845 is released to Insiders. Feb. 26: Microsoft will begin broad testing of the Lite OS this summer, after announcing it at Build, according to a Petri report. • Test build 18346 of Windows 10 19H1 is released. Feb. 22: Microsoft releases test build 18343 of Windows 10 19H1 and test build 18841 of 20H1. Feb. 20: Test build 18342 of 19H1 is released to Insiders. • Windows "Lite" is now internally code-named "Santorini" and could debut as a preview during May's Build conference, according to a report by Windows Central's Zac Bowden citing unnamed sources. Feb. 14: Microsoft begins releasing test builds of Windows 10 20H1, ahead of the first 19H2 test builds, which will not be released to Insiders until "later this spring." • Microsoft is developing a Windows derivative called "Lite" that will compete with the Google Chrome OS and will run on devices code-named "Centaurus" and "Pegasus," according to a report by Petri's Brad Sams. Feb. 8: Preview build 18334 of Windows 10H1 is released to testers. Feb. 1: Mirosoft releases test build 18329 of Windows 10 19H1 to Insiders. Microsoft is widely expected to release the next major version of Windows 10, thought to be version 1903 and code-named "19H1," in April 2019. The desktop operating system follows a biannual (or "semiannual") upgrade release cycle, with major OS "feature updates" arriving in the spring and fall. Microsoft offers Windows 10 as both a semiannual channel Windows as a Service product, and as a more traditional long-term servicing channel product where new updates arrive every two or three years. Preview builds of Windows 10 19H1 have been rolling out to users enrolled in the Windows Insider program since July 2018. Besides minor feature additions and some tweaks to the UI, a couple of more significant changes have come to light, including the brand-new "Windows Sandbox." Expected to be part of the Pro and Enterprise editions of Windows 10, Sandbox is described by Microsoft as a walled-off computing environment where users can run new apps in isolation, keeping the rest of their PC protected. "Any software installed in Windows Sandbox stays only in the sandbox and cannot affect your host," Microsoft said in its announcement. "Once Windows Sandbox is closed, all the software with all its files and state are permanently deleted." Another new capability expected in Windows 10 19H1 is the "Reserved Storage" feature, which will set aside about 7GB of a PC's disk space for new Windows 10 updates. This reserved space will help ensure that applications are able to properly run after an OS update, according to Microsoft. "Without reserved storage, if a user almost fills up her or his storage, several Windows and application scenarios become unreliable. Windows and application scenarios may not work as expected if they need free space to function. With reserved storage, updates, apps, temporary files, and caches are less likely to take away from valuable free space and should continue to operate as expected," the company said in a January blog post announcing the feature. March 19: Microsoft releases test build 18356.1 to Insiders. March 5: Test build 18346 of Windows Server vNext is released to Insiders. Feb. 12: Microsoft releases test build 18334 of Windows Server vNext. As of this writing, the next major version of Windows Server is three test builds in, the first build having arrived back in November 2018. Like its desktop OS counterpart, Windows Server gets "feature updates" on a biannual (or "semiannual") release cadence, which go by version numbers. There's also a long-term servicing channel product option, where new upgrades arrive every two or three years. Microsoft also releases a more traditional Windows Server product. Windows Server 2019, released back in October 2018, was the last such product. It doesn't get OS upgrades as frequently as the vNext semiannual product offering. The name and timing of the next traditional Windows Server product hasn't been announced. Organizations can expect the first Windows Server vNext feature update release, perhaps version 1903, to arrive sometime in the spring (likely in April, coinciding with the release of Windows 10 19H1). A second feature update release is planned for the fall. Outside of Microsoft's perfunctory release notes for each Windows Server vNext test build, the company thus far hasn't spotlighted any major changes or improvements to expect. Microsoft did hint at "new innovations in networking" when it issued test build 18298 in December, but said further details won't come until "the early new year." March 27: Microsoft releases update 1902 of System Center Configuration Manager (SCCM). March 14: System Center 2019 becomes generally available. March 7: Microsoft announces a March release for System Center 2019. The "2019"-branded iteration of the System Center management suite is due sometime in the first quarter of the year, according to a Microsoft document (PDF download). System Center is a suite of eight products, called "components," that consist of Configuration Manager, Data Protection Manager, Operations Manager, Orchestrator, Service Manager, Service Management Automation, Virtual Machine Manager, and Service Provider Foundation. Microsoft delivers major updates to System Center on a biannual (or "semiannual") basis in the spring and fall, a practice that started for the whole suite with the release of System Center version 1801 last year, although the Configuration Manager component is an exception in that it gets major updates three times per year. A long-term servicing channel version of the product, which gets new "feature updates" every two or three years, is also available. System Center 2019 will incorporate "[n]ew features and enhancements including integration, support and alignment with Windows Server 2019," according to the Microsoft document. It'll also include "[s]torage optimization and improvements to RBAC [role-based access control] in VMM [Virtual Machine Manager]." April 3: Microsoft releases Dynamics 365 Customer Insights. April 2: Microsoft holds a virtual "launch event" ahead of the April '19 release. Feb. 24: Microsoft announces the preview of Dynamics 365 Guides. Feb. 21: Microsoft announces previews of Dynamics 365 Product Visualize for iOS and Dynamics 365 Remote Assist for Android, as well as the upcoming preview of Dynamics 365 Fraud Protection in April. • Microsoft updates the April '19 product release notes. As of last July, Dynamics 365, Microsoft's enterprise resource planning solution, became another Microsoft product on a twice-yearly "feature update" schedule. The first of these updates, scheduled to be released on April 5 (following a Feb. 1 preview), will be a big one. The April 5 "general availability" release of Dynamics 365 will be "the first major update where all of our customers across Dynamics 365 will be on the latest version and on a consistent update schedule," Microsoft explained in an announcement at the end of 2018. "It's also a template of how major updates will be done going forward in April and October every year." Microsoft's release notes for this so-called "April '19 update" of Dynamics 365 became available just last month as a massive 315-page .PDF that the company plans to update in February as more features emerge. Already, the document lists "hundreds of new capabilities" coming in the April '19 update, including mixed reality and artificial intelligence enhancements across the entire suite. It's been well over two years since the last major release of Microsoft's enterprise integration server, BizTalk Server, became available. The next generation of the product is due sometime in mid-2019, based on the broad timeframe that Microsoft gave in an August 2018 announcement. At that time, Microsoft indicated that it would release BizTalk Server "vNext" about nine months after Windows Server 2019. The official launch of Windows Server 2019 came in October 2018 (though problems with the update caused Microsoft to subsequently pull the product and then rerelease it about a month later). That would put BizTalk Server's release somewhere after the mid-point of 2019. April 2: Visual Studio 2019 becomes generally available. March 5: Preview 3 of Visual Studio 2019 for Mac is released. Feb. 27: Microsoft releases the Visual Studio 2019 release candidate. Feb. 14: The Visual Studio 2019 "launch event" will be on April 2, according to Microsoft. Feb. 13: Microsoft releases Preview 3 of Visual Studio 2019. Microsoft first signaled that the next major release of Visual Studio was in the works back in the summer of 2018, soon after it acquired the open source code repository GitHub. Visual Studio 2019 is expected to be released sometime in the first half of 2019, roughly two years after the last current flagship version, Visual Studio 2017, rolled out. March 5: Azure DevOps Server 2019 becomes generally available. The successor to Microsoft's Team Foundation Server (TFS) product, Azure DevOps Server 2019, had its first release candidate back in November 2018 and its second just this January. That second release candidate is the product's last before becoming generally available, Microsoft said at the time, so its likely that the production-ready version of Azure DevOps Server 2019 will roll out sometime in the first quarter. March 27: Microsoft releases CTP 2.4 of SQL Server 2019. March 1: CTP 2.3 of SQL Server 2019 is released. It's still early days for Microsoft's next-gen database platform. SQL Server 2019's first public outing was at the 2018 Ignite conference last fall, when Microsoft made it available as a Community Technology Preview (CTP). As of this writing, Microsoft has issued just one other CTP build back in December. Though Microsoft hasn't given a definitive timeline for release, it's fair to say that SQL Server 2019 likely won't hit the general availability milestone until later in 2019 -- perhaps November, to coincide with the 2019 Ignite event. Microsoft has a lot of enhancements planned for SQL Server 2019, a big one being SQL Server Big Data clusters. SQL Server expert and Redmond columnist Joey D'Antoni described Big Data clusters as "a scale-out, data virtualization platform built on top of the Kubernetes (K8s) container platform." Also new to SQL Server 2019 is a feature called Accelerated Database Recovery (ADR), which expedites the process of undoing and rolling back database transactions. Feb. 24: Microsoft unveils HoloLens 2 at Mobile World Congress and begins taking preorders. Feb. 11: Microsoft releases a Mobile World Congress teaser video that purportedly shows the new AI processor for HoloLens 2. It's been roughly four years since Microsoft first debuted HoloLens, its augmented reality headset, which is being positioned as an industrial diagnostic tool on top of being a gaming peripheral. HoloLens was ground-breaking technology at the time, but as the rest of the industry caught up with other mixed-reality, virtual-reality and 3-D platforms and devices, that first-generation headset is now, as Redmondmag.com columnist Brien Posey put it, "starting to show its age." Microsoft now appears set to unveil version 2 of HoloLens sometime in the first half of 2019. Possibly, it'll make an appearance at the Mobile World Congress event in late February, per some reports. Details are scant about Microsoft's HoloLens 2 plans. However, Microsoft did confirm at its 2018 Build conference that it is resurrecting its old Kinect motion-sensing device with plans to turn it into an intelligent camera for the new HoloLens (among other use cases). The following products were featured in our 2018 Microsoft Product Roadmap. Click on a product name to jump to that section. • Windows Server and "Project Honolulu"
Dec. 19: Microsoft unveils a new "Office" app for Windows 10. Dec. 18: Microsoft announces a new feature called Windows Sandbox expected for Windows 10 19H1. Dec. 17: Microsoft updates its Windows 10 update history page to designate version 1809 as "fully available." Dec. 10: Windows 10 19H1 preview build 18298 is released to testers. Nov. 28: Microsoft releases test build 18290 of Windows 10 19H1. Nov. 14: Windows 10 19H1 test build 18282 is released to Insiders. Nov. 13: Microsoft officially re-issues the Windows 10 October 2018 Update. Nov. 7: Test build 18277 of Windows 10 19H1 is released to Insiders. Oct. 31: The next two Windows 10 updates following 19H1 will be code-named "Vanadium" and "Vibranium," according to a report by ZDNet's Mary Jo Foley, citing unnamed sources. • Test build 18272 of Windows 10 19H1 is released to testers. Oct. 24: Microsoft releases build 18267 of Windows 10 19H1 to Insiders. Oct. 17: Windows 10 19H1 preview build 18262 is released to testers. Oct. 9: Microsoft says it is retesting the fixed version of the October 2018 Update before officially re-releasing it. Oct. 6: Microsoft has paused the October 2018 Update rollout to "investigate isolated reports of users missing some files after updating," according to an update on the Windows 10 update history page. Oct. 3: Microsoft releases Windows 10 19H1 test build 18252 to Insiders. Oct. 2: Microsoft announces the release of the Windows 10 October 2018 Update. Sept. 26: Windows 10 19H1 test build 18247 is released to Insiders. Sept. 25: The Windows 10 October 2018 Update could be released on Oct. 2, according to reports. Sept. 18: The Windows 10 October 2018 Update test build 17763, possibly the RTM build, is released to Insiders. • Microsoft also releases test build 18242 of Windows 10 19H1. Sept. 14: Build 17760 of the Windows 10 October 2018 Update is released to testers. Sept. 12: Build 18237 of Windows 10 19H1 is released to testers. Sept. 11: Microsoft releases build 17758 of the Windows 10 October 2018 Update to Insiders. Sept. 7: Build 17755 of the Windows 10 October 2018 Update is released to testers. Sept. 6: Microsoft releases a new test build, 18234, of the "19H1" release of Windows 10. Sept. 5: Test build 17754 of the Windows 10 October 2018 Update is released to Insiders. Aug. 31: The official name for Redstone 5 will be the "Windows 10 October 2018 Update," according to a Microsoft announcement. Aug. 24: Microsoft releases Redstone 5 Insider build 17746. Aug. 21: Redstone 5 preview build 17744 is released to Insiders. Aug. 16: The next major releases of Windows 10 and Windows Server will feature smaller monthly updates, according to Microsoft. Aug. 14: Redstone 5 test build 17738 is released to Insiders. Aug. 10: Microsoft releases Redstone 5 test build 17735 and 19H1 test build 18214. Aug. 8: Redstone 5 test build 17733 is released to Insiders. • Microsoft is reportedly developing a sandboxed computing environment for Windows 10 Enterprise called "InPrivate Desktop," according to BleepingComputer. Aug. 3: Microsoft may add a new SKU called "Windows 10 Enterprise for Remote Sessions" as part of Redstone 5, according to reports. • Redstone 5 test build 17730 is released to Insiders. Aug. 2: Microsoft is developing a Windows Pseudo Console for the next Windows 10 release. July 31: Redstone 5 test build 17728 is released to Insiders. July 25: Microsoft releases Redstone 5 test build 17723, as well as build 18204, the first test build of "Redstone 6" (code-named 19H1). July 18: Microsoft releases the public preview of Windows 10 IoT Core Services. July 11: Microsoft releases test build 17713 of Redstone 5. • Redstone 5 will officially be called "Windows 10 October 2018 Update," according to Microsoft watcher WalkingCat. July 10: The Windows 10 April 2018 Update is now the semiannual channel release, Microsoft announces. July 6: Test build 17711 of Redstone 5 is released to Insiders. June 27: Redstone 5 test build 17704 is released to Insiders without the "Sets" feature. June 14: The Windows 10 April 2018 Update is now in the "full availability" stage, Microsoft says. • Redstone 5 test build 17692 is released to Insiders. June 6: Redstone 5 test build 17686 is released to Insiders. May 31: Microsoft releases build 17682 of Redstone 5 to testers. May 24: Redstone 5 test build 17677 is released to Insiders. May 22: The Windows 10 April 2018 Update will arrive to HoloLens "soon," according to Microsoft. May 16: Test build 17672 of Redstone 5 is released to Insiders. May 9: Microsoft releases Redstone 5 test build 17666. May 3: Redstone 5 test build 17661 is released to Insiders. April 30: Microsoft releases the Windows 10 April 2018 Update. April 27: Microsoft announces that Redstone 4, officially called the Windows 10 April 2018 Update, will become generally available on April 30. April 25: Redstone 4 could be released on May 8 in the U.S., according to a purported leak of an internal memo to Chinese retailers. • Redstone 5 test build 17655 is released to Insiders. April 22: Redstone 4's official name might be "Windows 10 April Update," according to reports. April 20: Microsoft is reportedly working on a lightweight version of Windows 10 called "Lean." April 19: Redstone 5 test build 17650 is released to Insiders. April 16: Redstone 4 could be officially named "Windows 10 April 2018 Update," according to a report. • Microsoft releases Redstone 4 test build 17134 to Insiders and explains the previously intended RTM build had suffered from BSOD issues. April 13: Microsoft no longer considers Redstone 4 test build 17133 to be the RTM version, delaying the product's release, according to a Windows Central report. April 12: Microsoft releases Redstone 5 test build 17643 to Insiders. April 4: Microsoft updates Sets in Redstone 5 test build 17639. March 29: Redstone 5 test build 17634 is released to Insiders. March 27: Test build 17133 for Redstone 4 is released to Insiders. March 26: Microsoft releases a preview of HoloLens for Redstone 4. March 23: Redstone 4 test build 17128 is released with the "Insider Preview" watermark removed, which marks the "phase of checking in final code to prepare for the final release," according to Microsoft. March 20: Redstone 4 test build 17127 is released to Insiders. March 16: Microsoft releases test build 17123 of Redstone 4 to Insiders. • Redstone 5 test build 17623 is also released to Insiders. March 13: An update to a Microsoft blog indicates Redstone 4 will be released in April. • Test build 17120 of Redstone 4 is released to Insiders. March 8: Reports indicate that Redstone 4's official name will be the "Spring Creators Update." March 7: All Windows 10 editions will come with an optional and free S Mode, according to Microsoft. • Microsoft releases build 17618 for Redstone 5 to testers. • Microsoft announces a new AI platform for developers coming in Redstone 4. March 6: Redstone 4 test build 17115 is released to Insiders. • Microsoft says it is readying new privacy features in Windows 10 to be released "this spring." • Microsoft's Joe Belfiore confirms in a Tweet that Windows 10 S will become a "mode" starting in 2019, not a "distinct version." March 2: Redstone 4 test build 17112 is released to Insiders. Feb. 27: Microsoft announces it will extend support for Windows 10 IoT Core and Windows 10 IoT Enterprise to 10 years with Redstone 5. • Test build 17110 of Redstone 4 is released to Insiders. Feb. 23: Redstone 4 test build 17107 is released to Insiders. Feb. 14: Microsoft release Redstone 4 test build 17101 in addition to the first Redstone 5 test build (17604). Feb 7: Microsoft releases Redstone 4 test build 17093 to Insiders. Feb. 3: Microsoft is introducing a new Windows 10 SKU lineup for consumers with Redstone 4, reports Thurrott.com's Brad Sams. • A separate report indicates that Windows 10 S will no longer be a standalone SKU, but will be included in all Windows 10 versions as an "S mode." Microsoft's semiannual release schedule for Windows 10 is less of a novelty now than it was back in 2015, when Microsoft ushered in the OS under a new "as-a-service" model. Three years and five version updates later, Microsoft is expected to stick to an update model it nailed down last year, with one major update release coming in the first half of the year (usually spring) and another in the second (usually fall). The first major update, code-named "Redstone 4," has been in the works since August 2017, when the first preview build was made available to Windows Insider testers. Based on each subsequent build's release notes, Redstone 4 looks to be focused largely on feature refinements and usability improvements. There's more support for fonts and languages. The touch keyboard and handwriting features are constantly getting improvements, along with the Edge browser and the Windows Shell. New connectivity and power management enhancements are in the works. And with each build, Microsoft is activating more fluent design components. There are a couple of brand-new additions, too. In the works for Redstone 4 is a new "Near Share" feature that lets Windows 10 users exchange files with PC users in their vicinity via Bluetooth. Microsoft is also reinstating the "Timeline" feature, which had originally been slated to appear in last October's Fall Creators Update. Timeline essentially lets Windows 10 users keep a record of their recent activities in any given app, making it easier to resume a task when they pull up that app again. And in a more recent build, Microsoft debuted a privacy app called "Windows Diagnostic Data Viewer" that gives users and administrators a better handle on the kinds of telemetry data that Microsoft collects from Windows 10 devices. Redstone 4 will be followed by another release code-named "Redstone 5" in the later part of 2018. This early in the year, it might be too early to forecast exactly what Microsoft has planned for this second release, though there's at least one feature that Microsoft has already bumped from Redstone 4 and into Redstone 5. "Sets," which first cropped up last November in a Redstone 4 build, is a workspace-management interface that revolves around tabs. Microsoft described Sets as a way "to make sure that everything related to your task: relevant webpages, research documents, necessary files and applications, is connected and available to you in one click." Earlier this year, Microsoft announced that it was pulling Sets from future Redstone 4 builds, though it will restore the feature in a "post-RS4 flight." Presumably, that means Redstone 5. Oct. 22: Skype for Business Server 2019 is now generally available. Sept. 24: Microsoft announces new Teams capabilities at Ignite, and that Skype for Business Server 2019 will be released "by end of year." Sept. 18: Teams is generally available for the Surface Hub. Aug. 24: Microsoft deems Teams a "complete meeting and calling solution" that's suitable to replace Skype for Business in organizations. July 24: Skype for Business Server 2019 becomes available as a commercial preview. July 16: Microsoft now considers Teams and Skype for Business to have "feature parity," according to reports. July 12: Microsoft officially releases a free version of Teams. June 28: Teams Direct Routing is now generally available. • Microsoft says U.S. Government Community Cloud users will start to get Teams on July 17, with the rollout expected to be completed by the end of August. June 13: Microsoft observer WalkingCat points to Microsoft documentation detailing the rumored free Teams tier. May 15: Microsoft launches a preview of Direct Routing in Teams. May 2: Microsoft announces a free one-year trial offer for Teams starting June 1. May 7: Microsoft announces new Teams capabilities at Build 2018. April 20: The Skype for Business and Teams apps for Windows Phone will be retired on May 20, according to Microsoft. April 5: Microsoft rolls out a combined Teams-Skype for Business management portal. March 13: Microsoft has begun testing the Teams progressive Web app (PWA), according to a Petri report. March 12: Microsoft details new features coming to Teams, including support for Skype Room Systems and the Surface Hub in the first half of 2018, and "Direct Routing" in Q2. Feb. 27: Microsoft extends the Teams guest access feature. Feb. 26: Microsoft may be planning a "freemium tier" for Teams, according to a Petri report. Feb. 8: Microsoft is keeping the Standard edition for Skype for Business Server 2019, contrary to earlier plans. Feb. 5: A preview of the Call Analytics feature is now available in Teams, along with other new capabilities. Barely a year old, Teams is already being positioned by Microsoft as an integral piece of its enterprise collaboration portfolio. The Office 365 chat service launched last March as Microsoft's answer to the popular collaboration startup, Slack. Since then, Microsoft has taken significant steps to bolster Teams' enterprise bona fides through regular updates, providing IT management tools, mobile app support, integration with popular third-party apps like Dropbox and Google Drive, and a "guest access" feature that lets users collaborate with members of outside organizations. Microsoft has also been stumping for Teams in the academic space, offering it to schools through the no-cost Office 365 for Education plan, and rolling out UI features designed specifically for students and teachers. Now, Microsoft plans to advance Teams even further by making it the company's primary unified communications (UC) offering, effectively replacing Skype for Business. Microsoft first announced the planned transition last September at the Ignite conference, calling the move part of its "new vision for intelligent communications." That vision entails Teams inheriting Skype's voice calling and meeting capabilities, as well as AI and machine learning capabilities via the Microsoft Graph, while running on Skype's infrastructure for the back-end. Those Skype calling capabilities became available in Teams last December. By the end of Q2 2018, Microsoft also expects to add screen-sharing, third-party video support, voicemail capabilities and transcription/recording services. Other features, including "location-based routing," "group call pickup," "call park" and "shared line appearance," are due by year's end, according to Microsoft. Sept. 24: Microsoft releases Office 2019 for Windows and Mac, and indicates that it plans to release at least one more "perpetual-license" version of Office in the future. July 25: Microsoft announces Office 2019 licensing changes, including a price hike, that will take effect on Oct. 1. June 12: Microsoft releases the preview of Office 2019 for Mac. April 27: Microsoft launches the commercial preview of Office 2019. April 18: Microsoft says Office 2019 will not support OneNote 2016. Cloud may be king at Microsoft nowadays, with the Office 365 productivity suite taking much more of a leading role in Microsoft's product development efforts compared to its on-premises or retail "boxed" counterpart, but Microsoft hasn't thrown in the towel on its old-school Office software yet. At its Ignite conference, Microsoft announced that it was readying the next version of the on-premises Office product, dubbed "Office 2019," for public release sometime in the second half of 2018. In a blog post announcing Office 2019, Microsoft Office General Manager Jared Spataro characterized the upcoming release as an olive branch to organizations that are still wary of making the move to the cloud. "Cloud-powered innovation is a major theme at Ignite this week. But we recognize that moving to the cloud is a journey with many considerations along the way. Office 2019 will be a valuable upgrade for customers who feel that they need to keep some or all of their apps and servers on-premises," he wrote. Dec. 4: The first preview of Visual Studio 2019 is released. Nov. 20: Azure DevOps Server 2019 RC1 is released. Oct. 17: The first preview of Visual Studio 2019 will be released by year's end, with general availability in the first half of 2019, according to a Microsoft announcement. Sept. 10: Microsoft renames Visual Studio Team Services (VSTS) to Azure DevOps. The next major version of Visual Studio is "now in the early planning phase," Microsoft said in June, over two years after the release of Visual Studio 2017. This announcement represented Microsoft's first official mention of Visual Studio 2019. It was prompted by the company's freshly announced acquisition of GitHub, where Microsoft's developer teams do a lot of their work. Expect more and better refactorings, better navigation, more capabilities in the debugger, faster solution load, and faster builds. But also expect us to continue to explore how connected capabilities like Live Share can enable developers to collaborate in real time from across the world and how we can make cloud scenarios like working with online source repositories more seamless. Expect us to push the boundaries of individual and team productivity with capabilities like IntelliCode, where Visual Studio can use Azure to train and deliver AI-powered assistance into the IDE. Montgomery added that Visual Studio 2019 previews, whenever they roll out, will be able to run on the same machines as Visual Studio 2017. Microsoft began sharing the earliest details of its next-gen BizTalk Server product in early August, including an estimated release timeframe of "within roughly 9 months of the general availability of Windows Server 2019." That Windows Server product is slated for release sometime in the second half of 2018, which ostensibly pushes the BizTalk Server "vNext" release into early 2019. Oct. 22: SharePoint Server 2019 becomes generally available. Sept. 24: Microsoft says SharePoint Server 2019 will become generally available in October. July 24: Microsoft releases the SharePoint Server 2019 preview. May 21: The public preview of SharePoint Server 2019 will be released in June, according to Microsoft. • Microsoft launches a preview of SharePoint Spaces. Another anticipated -- but as-yet unconfirmed -- component of SharePoint Server 2019 could be the potential for continued support for InfoPath, Microsoft's now-deprecated electronic forms software, even though Microsoft is grooming PowerApps and Microsoft Flow to be InfoPath's successor. Dec. 10: Microsoft releases its Exchange 2019 preferred architecture. Oct. 22: Exchange Server 2019 is now generally available. July 24: The public preview of Exchange Server 2019 is released. Nov. 2: Microsoft releases Dynamics 365 AI for Sales. Oct. 1: Dynamics 365 Remote Assist and Dynamics 365 Layout become generally available. Sept. 18: Microsoft describes five new AI/mixed reality modules coming to Dynamics 365. July 22: Microsoft releases details of Dynamics 365's October 2018 update. July 6: Microsoft announces its plan to move Dynamics 365 to a semiannual update model (April and October) starting this year. April 10: Dynamics 365 for Marketing becomes generally available. April 2: Microsoft announces the general availability of Dynamics 365 Business Central (cloud), with an on-premises/hosted version arriving in the fall. March 21: Microsoft describes Dynamics 365's spring update, including the planned release of Dynamics 365 for Marketing and the introduction of Dynamics 365 for Sales Professional. March 20: Microsoft announces planned feature deprecations in Dynamics 365 portals. March 13: Microsoft Dynamics 365 Business Central will be released on April 2, according to Microsoft. March 12: Microsoft has started sharing details of its upcoming NAV-based offering, called "Microsoft Dynamics 365 Business Central," to select partners, according to an MSDynamicsWorld report. Feb. 15: Microsoft launches a preview of the Dynamics 365 support center. Feb. 6: Microsoft releases the Dynamics 365 for Marketing app to public preview, with general availability slated for spring. The last 12 months have proved to be a mixed bag for Dynamics 365, Microsoft's repackaged CRM and ERP cloud suite that first debuted in late 2016. Last spring, the company began integrating Dynamics 365 with LinkedIn, giving sales teams new ways to tap the vast well of information from the professional social network's 500 million registered users. Microsoft also launched the first of the "Dynamics 365 AI Solutions" at Ignite. Dynamics 365 AI Solutions is an initiative that links Dynamics 365 with Microsoft's various AI, machine learning and enterprise search offerings to solve what Steve Guggenheimer, head of Microsoft's Developer Platform & Evangelism unit, called "high-value, complex enterprise scenarios." New Dynamics 365 application components also debuted throughout 2017, including Dynamics 365 for Retail and Dynamics 365 for Talent. There have been some off notes, too. For instance, the long-promised integration between Dynamics 365 and Cortana, Microsoft's digital assistant, still hasn't come to fruition -- at least, not in the way that Microsoft had initially planned. In early January 2018, Microsoft announced in a short blog post that it would be "discontinuing the current Cortana integration preview feature that was made available for Dynamics 365," and instead "focusing on building a new long term intelligent solution experience, which will include Cortana digital assistant integration." Microsoft will offer a single collection of Dynamics 365 applications for customers of all sizes and complexity to digitally transform their organizations across all lines of business -- Marketing, Sales, Service, Finance, Operations, and Talent -- at their own pace. Instead of offering separate editions (e.g. "Business edition" and "Enterprise edition"), we will focus on enabling any organization to choose from different price points for each line of business application, based on the level of capabilities and capacity they need to meet their specific needs. Windows Server and "Project Honolulu"
Dec. 18: Windows Server vNext test build 18298 is released to Insiders. Nov. 20: The first test build of Windows Server vNext (semiannual channel), expected to roll out in the first half of 2019, is released. Nov. 13: Microsoft re-issues Windows Server 2019 and Windows Server version 1809 after pausing their rollout after reports of problems related to Windows 10. Oct. 2: Windows Server 2019 beceomes generally available. Sept. 24: Windows Server 2019 will be released in October, Microsoft announced at Ignite. Sept. 20: Microsoft releases Windows Admin Center version 1809. Sept. 5: Windows Server 2019 Essentials for small businesses is expected to launch later this year, Microsoft says. Aug. 28: Test build 17744 of Windows Server 2019 is released to Insiders. Aug. 21: Microsoft releases test build 17738 of Windows Server 2019. Aug. 14: Microsoft releases test build 17733 of Windows Server 2019 and the long-term servicing channel. July 31: Preview build 17723 of Windows Server 2019 is released to Insiders. July 17: Windows Server 2019 preview build 17713 is released to Insiders. June 26: Microsoft details Windows Server 2019 support for hybrid and hyperconverged scenarios, and announces a 4PB Storage Spaces Direct boost. June 20: Preview Build 17692 of Windows Server 2019 (both the long-term servicing channel and the semiannual channel versions) is released, along with Windows Admin Center preview build 1806. May 29: Preview build 17677 of Windows Server 2019 is released to Insiders. May 15: Preview build 17666 of Windows Server 2019 and the next semiannual channel version is released to testers. May 3: The Windows Admin Center SDK is released to preview. April 29: Microsoft says the next Windows Server semiannual channel release, version 1803, will be released on May 7. April 24: Microsoft releases test build 17650 of Windows Server 2019 and the semiannual channel version. April 19: Microsoft enables the use of Windows Admin Center with Windows Server 2016 to manage hyperconverged infrastructure. April 12: Microsoft releases "Project Honolulu" under the official name of Windows Admin Center. April 10: Windows Server preview build 17639 is released to testers. March 29: The next Windows Server semiannual channel release (version 1803) will arrive in the first half of 2018, according to Microsoft. March 20: Microsoft releases Windows Server 2019 in preview, with general availability expected in the second half of 2018. • Microsoft releases test build 17623 of both the semiannual channel and the long-term servicing channel. March 13: Test build 1803 of the Project Honolulu technical preview is released to Insiders. Feb. 13: Microsoft releases test build 17093 of the next Windows Server semiannual channel release, as well as test build 1802 of Project Honolulu. Most of the excitement around Windows Server last year -- from a roadmap perspective, at least -- was generated from Microsoft's move to transition the product to the same biannual servicing model that Windows 10 and Office ProPlus now use. Under this so-called "semiannual channel" release cadence, Windows Server receives two major feature updates each year -- one in the spring and one in the fall. Users enrolled in the Windows Insider program can get early access to each semiannual channel release for testing purposes before it becomes generally available. The first Windows Server (and current) semiannual channel release was "version 1709," which hit general availability last October. The next semiannual channel release, dubbed "version 1803," is currently in the testing phase and should become available in March or April. Microsoft is offering this biannually updated product alongside its more traditional Windows Server 2016 product, where feature updates aren't as frequent. An obvious advantage of jumping on the semiannual channel train with Windows Server is the opportunity to get new and major feature changes, but organizations have some restrictions. They can only use the Server Core installation option for production workloads with Windows Server version 1709, or they can use Nano Server, but just for hosting containers. Management of Windows Server version 1709 comes via a remote tool called "Project Honolulu," a browser-based solution that replaces the earlier Server Management Tools product. Now in technical preview, Project Honolulu is expected to become generally available "sometime in 2018," according to a Microsoft infograph from Ignite. Kurt Mackie contributed to this report. NopCommerce 4.10 is out the door and looking awesome with great new features among which is the support for .NET Core 2.1. The release note of this new version is no different from any previous ones, it is quite long including more than 100 items. Just looking at it could be overwhelming. But no worries. We have got you covered with this article in which we are going to digest this information and give you a detailed overview of the most important new features in nopCommerce 4.10. Let’s start with the flagship feature of nopCommerce 4.10, namely the support for .NET Core 2.1. The previous version 4.0 was built on top of ASP.NET Core but at the same time was targeting .NET 4.6.1. For more information on why this is please read our blog post on What’s new in nopCommerce 4.0. In NopCommerce 4.10 this has changed and the platform now runs on .NET Core 2.10 and Entity Framework Core, which supports lazy loading. The move to .NET Core means that nopCommerce is now leaner, more modular, more versatile when it comes to deployment options (you do not have to have IIS to run your store) more performant and developers can make use of new .NET Core features like partial Tag Helpers, SignalR, Span<T>, Memory<T>, improved support for Docker container, etc. It is important to note that nopCommerce 4.10, although now targeting .NET Core 2.10, still lacks cross-platform support. This important development was postponed for version 4.10 as it requires a substantial effort and would have delayed this release significantly. The next feature is the reason why nopCommerce 4.10 had to be released as soon as possible. The General Data Protection Regulation has been in effect since the 25th of May. The regulation simply requires businesses to protect the personal data and privacy of EU citizens for transactions that occur within EU member states. In its essence, the GDPR shifts the ownership of customer data from the organizations that use it to the individual customer. Customer data refers to any information such as name, address, and ID numbers; web data such as location, IP address, cookie data; or any genetic, psychological, cultural, religious and/or socioeconomic data that can be used to identify an individual. If you need to use the personal data of a customer for a specific purpose (for example send them promotional emails) you are required to have their consent. You need to make sure that you ask for their permission and have their consent. The customer can request to see what personal data related to them you are keeping in your store. You need to provide them with the means to see this data every time they require it. The customer should be able to delete their personal data from your store at any time. So you need to give them the tools to do so. As you can see running a store and being GDPR compliant is not so difficult. It is also a great opportunity to gain the trust of EU customers. Fortunately, nopCommerce 4.10 provides GDPR support and you can meet these three major requirements. Where to start? Let me point you to the right settings in the nopCommerce administration to get things going. You can create any type of consent messages depending on the nature of your business or the products and services you offer. For example, you have an online grocery store and you run a No Food Waste campaign. Each day you make a special selection of items which are about to expire soon. As part of the campaign, you wish to send a promo email to your customers of the daily promotions. You will need to get your customers' consent to send them promotional emails. In the store administration, you can select which consents are required for your store. You can also map a consent to a specific store if you are running a multi-store installation of nopCommerce. A record is kept for all consents a customer has granted or denied. The store owner can keep track of all consent activities in the GDPR request log. 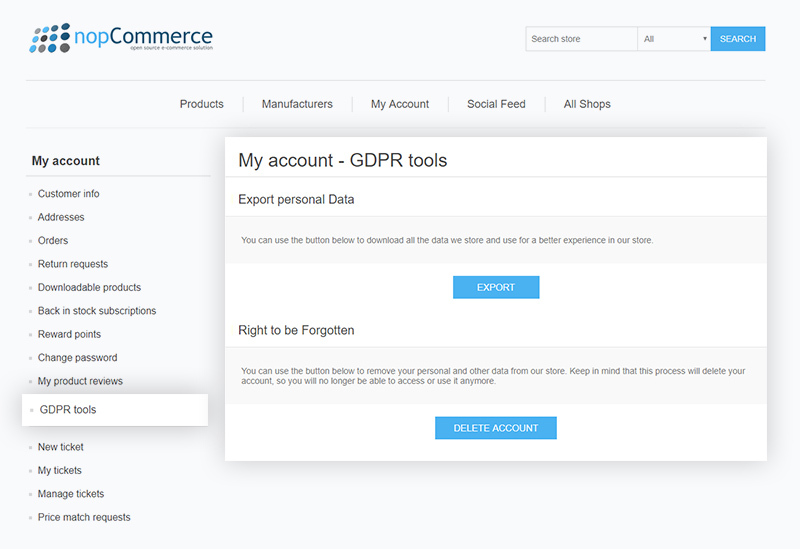 The customers can view all GDPR-related activities on their My Account page. They can also keep track of the consents they have given or denied. They can see what kind of personal information the store keeps. A customer can delete their account at any time along with all their personal information. Once a consent is granted, a customer may choose to revoke their consent at any time. If this happens, a store owner needs to act accordingly and make sure that they don’t violate the customer’s consent. The support for .NET Core 2.1 and GDPR are without a doubt the highlights in the 4.10 release. The shortlist of the features to follow are not to be overlooked either. They will also give a good reason to store owners to upgrade to nopCommerce 4.10. As store owners, managing Nop-Templates.com, we find the next feature extremely valuable. 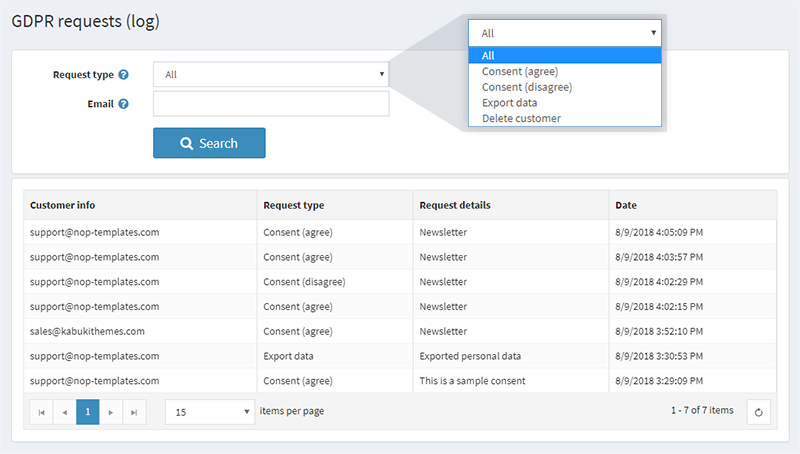 In nopCommerce 4.10, there is a preview in the administration for the news, topics and blog posts. In previous versions, we had to publish an article to view it. This was inconvenient especially with articles which required extensive formatting. Making changes to a blog post, for example, when it is live is not a good practice. Fortunately, in nopCommerce 4.10 this problem is solved and store owners can edit and polish their content as much as they need before publishing it. In previous nopCommerce versions, if you are running a multi-store and needed to have a poll on only one of your stores, the poll would appear on every store in your installation. Needless to say, this could be a showstopper in most cases because a poll relevant to one store is rarely applicable to other stores. 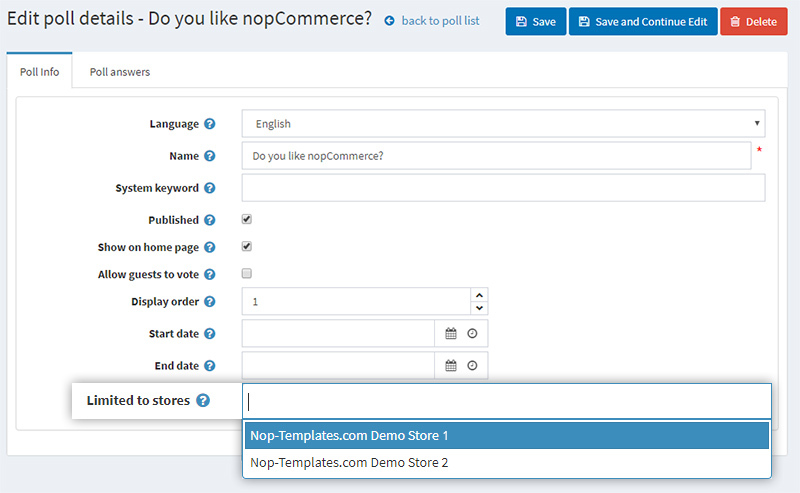 Now in nopCommerce 4.10 polls can be created per store solving this problem. 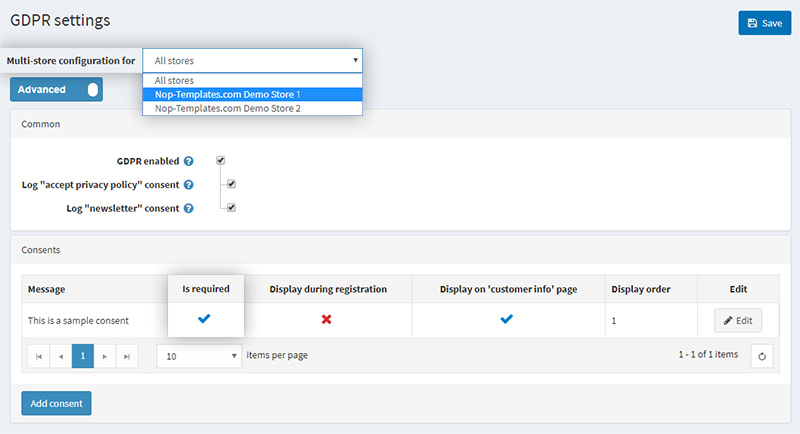 In nopCommerce 4.10 a customer gets a notification when they receive a reply to a product review. The option to send a notification can be useful when a store owner wants to be sure that a customer reads their reply. For example, let's say that a customer has left a bad review. As a store owner, it would be important to me to reply to them and ask follow-up questions. Their feedback can help me improve the product or the service. This will not be possible if there is no way for the customer to know that I have replied to their review. A simple change can make a big difference when it saves time. 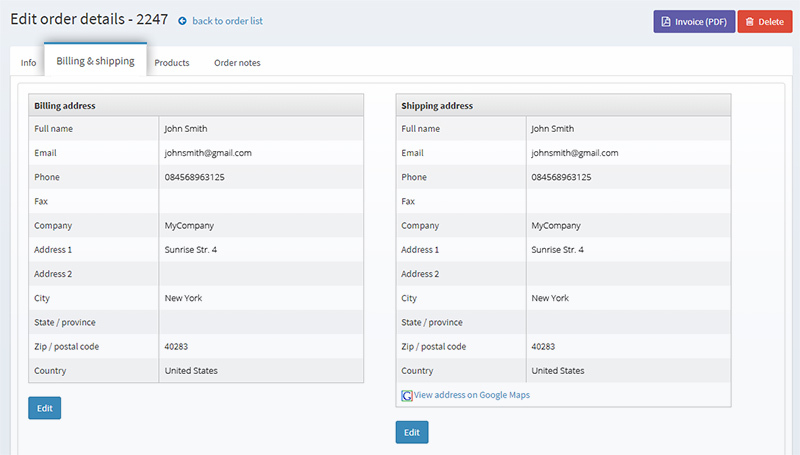 Now, a store owner can view the order billing and shipping information in a single tab. This makes it easy for the store owner to compare the billing and shipping addresses for each order. No switching of tabs is required anymore. 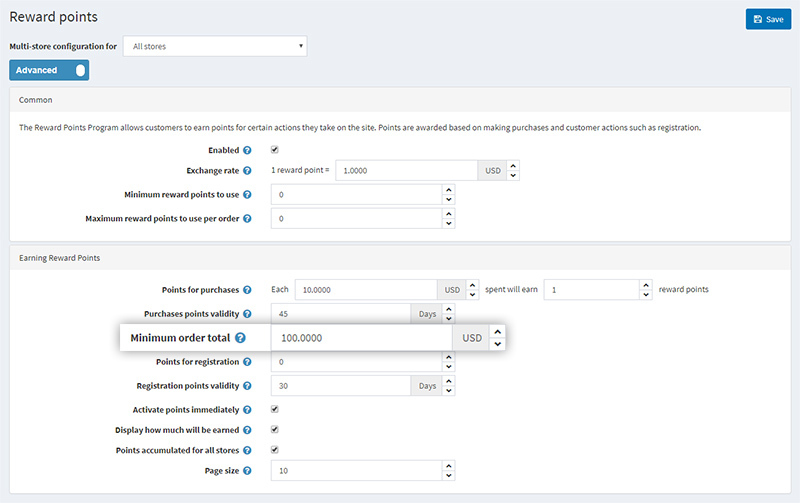 Before nopCommerce 4.10, product prices could be adjusted based on specific attributes with a fixed amount only. In the new version, these price adjustments can be done in percentage points. This gives much more flexibility when running a sale for example. A store owner does not have to edit their price adjustments every time the price of a product changes. You are probably aware that in nopCommerce, a product can have required products. 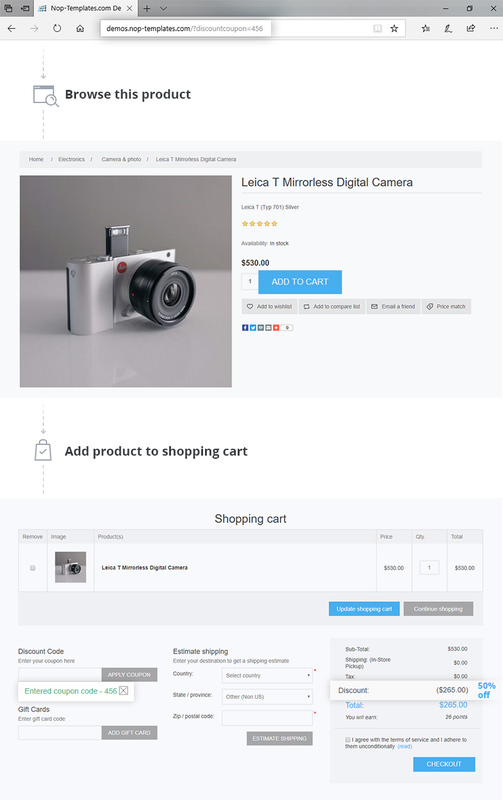 These are products that are required to be purchased along with the main product and are automatically added to the shopping cart when the main product is added to the cart. In previous nopCommerce versions, buyers had to manually remove the required products from the shopping cart when the main product was removed. Not anymore. In nopCommerce 4.10 this is done automatically. A logical change which buyers and store owners will appreciate alike. In nopCommerce 4.10, the store owner can specify the minimum order total required for a customer to receive reward points. For example, I would like to give 1 reward point for every 10 dollars spent but only if the order placed is for at least $100. I can set this in Settings -> Reward point ->Minimum order total. Anyone who has placed an order for less than that amount will not receive the reward points. Now, a store owner can delete products from the customer’s shopping cart or wish list in the administration. In previous versions, they had to be in “impersonated mode” to perform this action which was much more time-consuming. 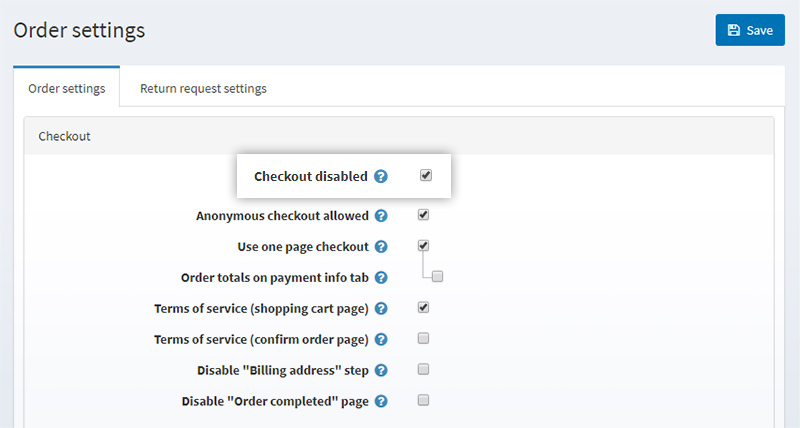 In nopCommerce 4.10 store owners can disable the checkout in the administration of their store. This comes in handy when a store owner wishes to have a product catalog website, where shoppers can browse products but cannot purchase them. To enable this option go to Settings -> Order Settings -> Checkout disabled. A store owner needs to enable the "allow download images" setting to make use of this feature. This setting can be found in Catalog Settings -> Import/Export and will allow importing product images from a remote server when importing products from XML/XLS. The store owner can now include an URL from an external source in the picture fields of the XML/XLS file. In previous nopCommerce versions, a store owner could import product images only from a local machine. 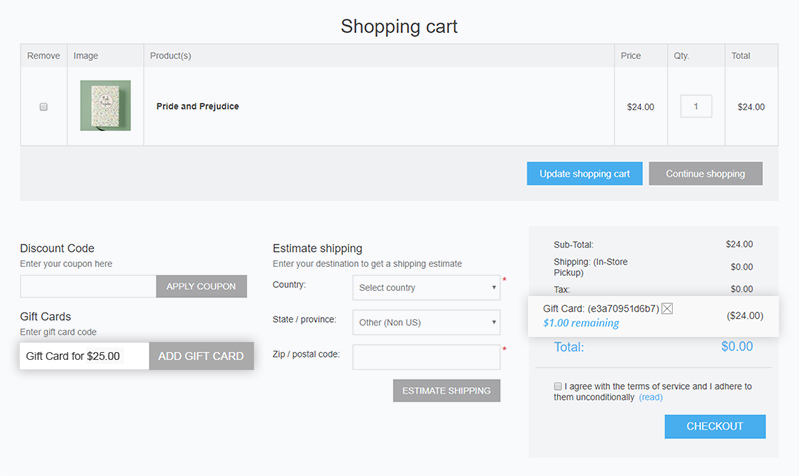 If a customer applies a gift card to their order, the gift card balance will appear in the order summary. He will know exactly how much money is left in the gift card for future purchases. This was not possible in previous versions of nopCommerce. In fact, there was no way for the customer to know their gift card balance. We are crazy about this new feature and we are sure that other store owners will fall in love with it as well. 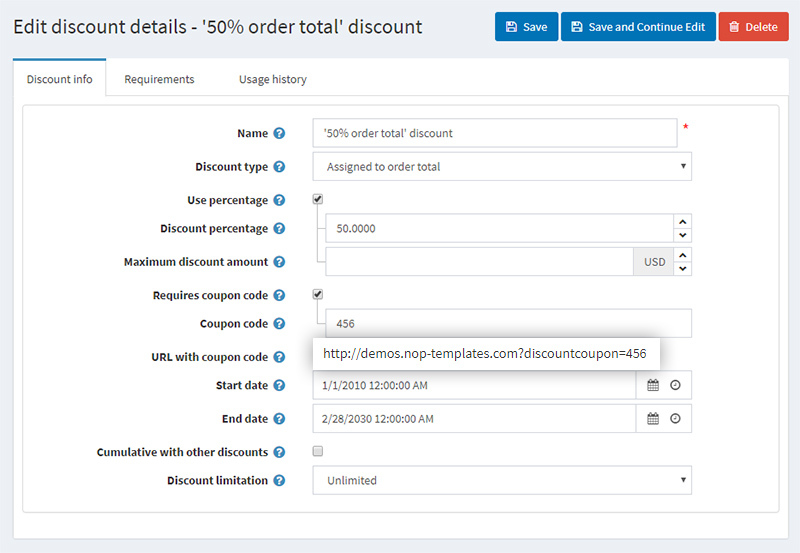 In nopCommerce 4.10, the store owner can provide external links with a discount coupon code so that a shopper doesn’t have to apply the coupon code at the checkout. Why is this useful? I will illustrate the importance of this feature with a practical example. Let’s say you have a 50% sale on all products and you run a Google ad to advertise this offer. For this purpose, you create a 50% discount in the store’s administration of type “assign to order total”. You will see that a link is automatically generated. You point your Google ad to this link. Next, a shopper clicks on your ad, lands on your store and adds a product to their shopping cart. The 50% discount will be applied automatically and the price of the product will be discounted. 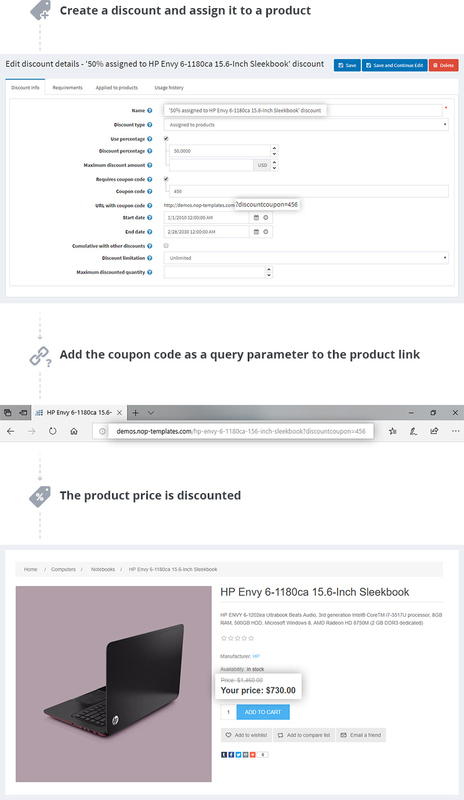 If your discount is assigned to a specific product or category the discounted prices will be immediately visible when your shoppers go to the product or category page, provided that they have the coupon code in the query string. Here’s an example. As you can see the price of the HP Laptop is automatically discounted. In nopCommerce 4.10 the Google Analytics plugin now uses the new global site tag (gtag.js) from Google. Why should you care? The global site tag is developed by the same team that created the Google Tag Manager at Google and replaces the analytics.js tag for Google Analytics and the conversion tracking tag for Google Ads. This means that the new gtag.js is designed to streamline tagging on your website for all Google Products. The global site tag sets new cookies for your website, which measure which clicks from your Google Ads bring traffic to your website. In this way, Google Ads can measure conversions much more accurately. You can also configure which interactions with your store should be considered Google Ads conversion. Most importantly by having the new global site tag on your website, you will be able to access new features as they are released on the new Google Marketing Platform. If you are keen on having stunning looking-landing pages, like we are, then you will definitely appreciate this new feature. In nopCommerce 4.10 you can link CSS style sheets in the richTextbox editor. 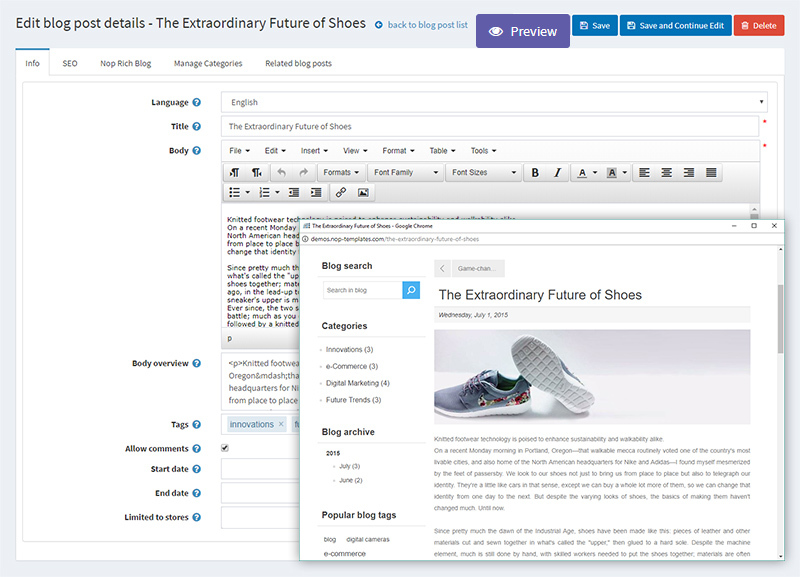 In this way, you can style every landing page or content generated with the richTextbox editor individually. Let's next look at a few very useful new dvelopments that are more specific to nopCommerce plugin and theme developers. This is an important little addition, especially to theme developers. Before nopCommerce 4.10 if we were to modify the theme of a nopCommerce store by changing the CSS or JS files, the changes would not have been reflected in the browser of a customer who has visited the store before, unless they clear the browser cache. Let’s say we change the background color of the homepage of a store by modifying the main CSS file of the theme. All customers who visit the store for the first time will see the new background color. But customers who have previously visited the store will see the old background color because the browser is serving them the CSS file from its local cache. NopCommerce 4.10 appends a version number to CSS and JS file links and bundles. Every modification changes the version in the links which means that every time a CSS or JS file is changed the browser sees a new file and loads it from the store server instead of loading it from its browser cache. Move business logic from extension methods to services. Extension methods could be useful for framework developer to expose functionality in a fluent syntax. But when you have classes that you can control which is the case with nopCommerce service classes, then extension methods could be harming the design of your code. Static classes that contain extension methods like anything static in OOP cannot benefit from polymorphism because they cannot implement interfaces or be inherited. Naturally, they are more difficult to test too. 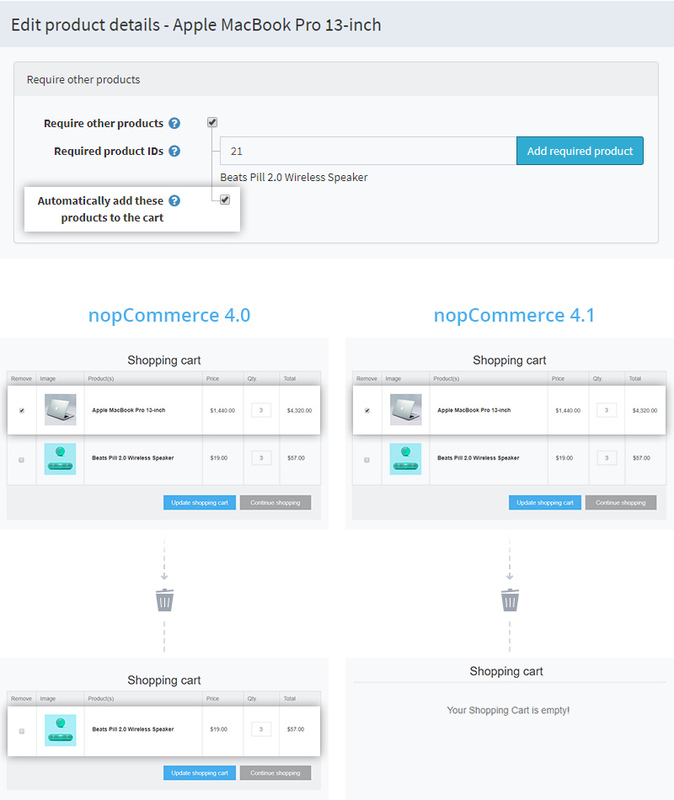 Therefore, we welcome the fact that in version 4.10 the nopCommerce team has decided to move the code from various extensions methods like GetSeName, GetProductPicture, etc. to service classes. In this way, the code in these methods can be overridden and also swapped through the DI Container. Some developers might miss the fluentness of the extension methods syntax. Yet, being nopCommerce developers ourselves, we view this change as trading a highly sweetened fructose-syrup beverage with a freshly-squeezed orange juice. I am sure not many nopCommerce developers will miss SQL Server Compact especially that it has been in deprecation mode with no new releases planned for years now. So no surprises here, the nopCommerce team has decided to abandon this SQL Server edition. 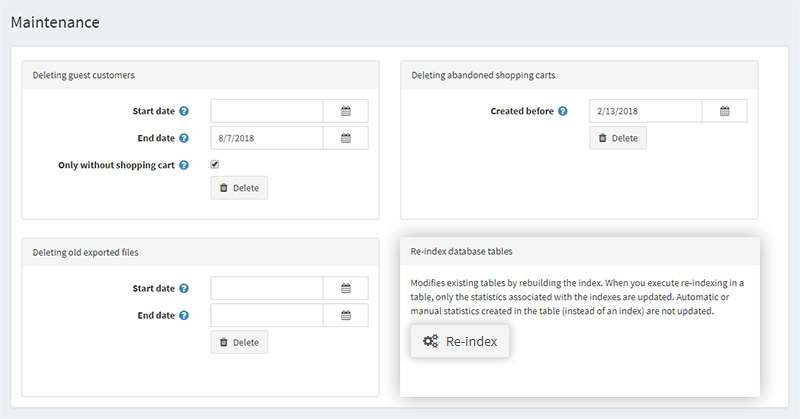 In nopCommerce 4.10 if you open the administration and go to System -> Maintenance you will see a new panel named “Re-index database tables” with a “Re-index” button. Why would you want to press this button? Over time and especially with a busy nopCommerce website the indexes in the database can become fragmented. This can lead to a database that performs more slowly. In such situations, the new database reindexing feature can come in handy. When you build ASP.NET Core applications and plan on running them on IIS, you'll find that .NET Core applications in IIS work radically different than previous versions of ASP.NET. In this post I'll explain how ASP.NET Core runs in the context of IIS and how you can deploy your ASP.NET Core application to IIS. The most important thing to understand about hosting ASP.NET Core is that it runs as a standalone, out of process Console application. It's not hosted inside of IIS and it doesn't need IIS to run. ASP.NET Core applications have their own self-hosted Web server and process requests internally using this self-hosted server instance. You can however run IIS as a front end proxy for ASP.NET Core applications, because Kestrel is a raw Web server that doesn't support all features a full server like IIS supports. This is actually a recommended practice on Windows in order to provide port 80/443 forwarding which kestrel doesn't support directly. For Windows IIS (or another reverse proxy) will continue to be an important part of the server even with ASP.NET Core applications. 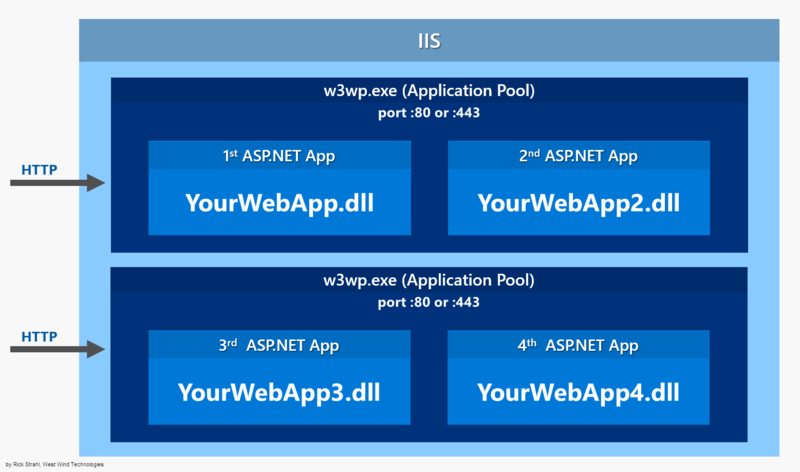 Let's take a look and see how IIS fits into ASP.NET Core applications. In a classic ASP.NET application everything is hosted inside of an IIS Worker Process (w3wp.exe) which is the IIS Application Pool. The AppPool hosts your ASP.NET application and your application is instantiated by the built-in ASP.NET hosting features in IIS. The native runtime manager instantiates the .NET Runtime on your application's behalf and brings up the HttpRuntime object which is then used to fire requests through the ASP.NET application pipeline as requests come in from the native http.sys driver. Requests come in from http.sys and are dispatched to the appropriate site that is mapped to the Application Pool and the HttpRuntime instance hosted there. Things are quite different with ASP.NET Core which doesn't run in-process to the IIS worker process, but rather runs as a separate, out of process Console application that runs its own Web server using the Kestrel component. Kestrel is a .NET Web Server implementation that has been heavily optimized for throughput performance. It's fast and functional in getting network requests into your application, but it's ‘just’ a raw Web server. It does not include Web management services as a full featured server like IIS does. If you run on Windows you will likely want to run Kestrel behind IIS to gain infrastructure features like port 80/443 forwarding via Host Headers, process lifetime management and certificate management to name a few. ASP.NET Core applications are standalone Console applications invoked through the dotnet runtime command. They are not loaded into an IIS worker process, but rather loaded through a native IIS module called AspNetCoreModule that executes the external Console application. The AspNetCoreModule has to be installed on your server and is part of the ASP.NET Core Server Hosting Bundle. 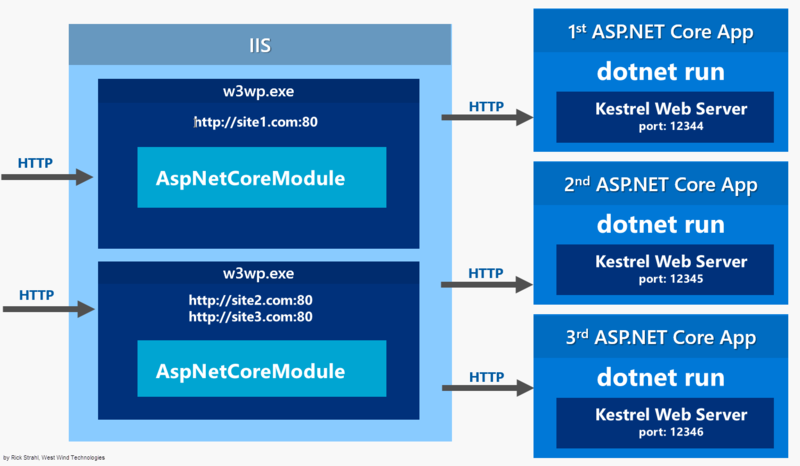 The AspNetCoreModule is a native IIS module that hooks into the IIS pipeline very early in the request cycle and immediately redirects all traffic to the backend ASP.NET Core application. All requests - even those mapped to top level Handlers like ASPX bypass the IIS pipeline and are forwarded to the ASP.NET Core process. This means you can't easily mix ASP.NET Core and other frameworks in the same Site/Virtual directory, which feels a bit like a step back given that you could easily mix frameworks before in IIS. While the IIS Site/Virtual still needs an IIS Application Pool to run in, the Application Pool should be set to use No Managed Code. Since the App Pool acts merely as a proxy to forward requests, there's no need to have it instantiate a .NET runtime. 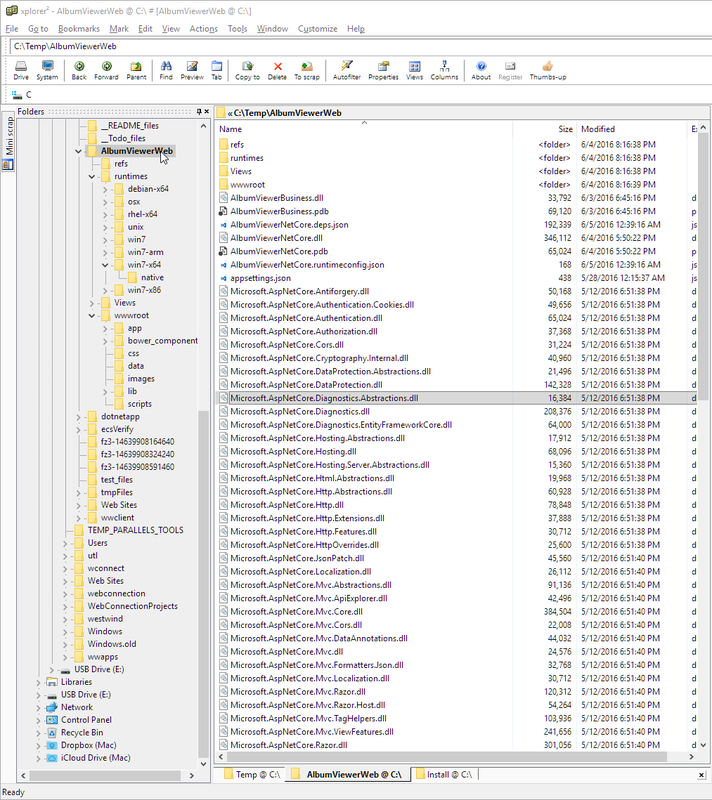 The AspNetCoreModule's job is to ensure that your application gets loaded when the first request comes in and that the process stays loaded if for some reason the application crashes. You essentially get the same behavior as classic ASP.NET applications that are managed by WAS (Windows Activation Service). Once running, incoming Http requests are handled by this module and then routed to your ASP.NET Core application. So, requests come in from the Web and int the kernel mode http.sys driver which routes into IIS on the primary port (80) or SSL port (443). The request is then forwarded to your ASP.NET Core application on the HTTP port configured for your application which is not port 80/443. In essence, IIS acts a reverse proxy simply forwarding requests to your ASP.NET Core Web running the Kestrel Web server on a different port. Kestrel picks up the request and pushes it into the ASP.NET Core middleware pipeline which then handles your request and passes it on to your application logic. The resulting HTTP output is then passed back to IIS which then pushes it back out over the Internet to the HTTP client that initiated the request - a browser, mobile client or application. 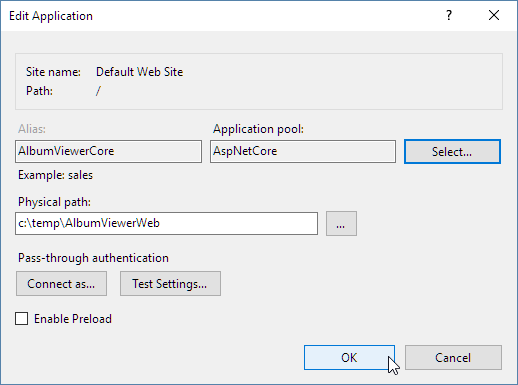 The AspNetCoreModule is configured via the web.config file found in the application's root, which points a the startup command (dotnet) and argument (your application's main dll) which are used to launch the .NET Core application. The configuration in the web.config file points the module at your application's root folder and the startup DLL that needs to be launched. You can see that module references dotnetexe and the compiled entry point DLL that holds your Main method in your .NET Core application. We've already discussed that when running ASP.NET Core on Windows, it's recommended you use IIS as a front end proxy. While it's possible to directly access Kestrel via an IP Address and available port, there are number of reasons why you don't want to expose your application directly this way in production environments. First and foremost, if you want to have multiple applications running on a single server that all share port 80 and port 443 you can't run Kestrel directly. Kestrel doesn't support host header routing which is required to allow multiple port 80 bindings on a single IP address. Without IIS (or http.sys actually) you currently can't do this using Kestrel alone (and I think this is not planned either). The AspNetCoreModule running through IIS also provides the necessary process management to ensure that your application gets loaded on the first access, ensures that it stays up and running and is restarted if it crashes. The AspNetCoreModule provides the required process management to ensure that your AspNetCore application is always available even after a crash. It's also a good idea to run secure SSL requests through IIS proper by setting up certificates through the IIS certificate store and letting IIS handle the SSL authentication. The backplane HTTP request from IIS can then simply fire a non-secure HTTP request to your application. This means only a the front end IIS server needs a certificate even if you have multiple servers on the backplane serving the actual HTTP content. IIS can also provide static file serving, gzip compression of static content, static file caching, Url Rewriting and a host of other features that IIS provides natively. IIS is really good and efficient at processing non-application requests, so it's worthwhile to take advantage of that. You can let IIS handle the tasks that it's really good at, and leave the dynamic tasks to pass through to your ASP.NET Core application. The bottom line for all of this is if you are hosting on Windows you'll want to use IIS and the AspNetCoreModule. Can I run full IIS to run and debug my ASP.NET Core Applications like I could with classic applications? To sidestep this question a little: There should be very few reasons for you to run IIS during development. Yes, in the past there were very good reasons to run full IIS because there were always a number of things that behaved very differently in full IIS compared to IIS Express. However, with ASP.NET Core there's little to no reason to be running full IIS during development. Why? Because ASP.NET Core applications aren't actually running inside of IIS. Whether you running called from IIS, IIS Express or whether you do dotnet run directly from the command line - you are running the exact same code and in most cases the exact same execution environment. Running inside of IIS really doesn't buy you anything anymore that you can't easily simulate with a command line environment. The only reason you might need to run under IIS if there is something that IIS provides in terms of HTTP services that is really separate from the ASP.NET Core processing. But even then it's likely that those features won't be something you need to debug in the context of your application. The reason that you can't ‘just run IIS’ from your development environment is that an ASP.NET Core application has to be published before it can be executed. The development folder doesn't hold all the files necessary to run your application. When you 'debug' or ‘run’ your application the application is first published to a separate location and run from there. For this reason you don't see IIS as an option in Visual Studio for example. If you absolutely have to run with IIS, you can publish the application to a local folder first, then configure an IIS virtual directory or site and use that to run your site. 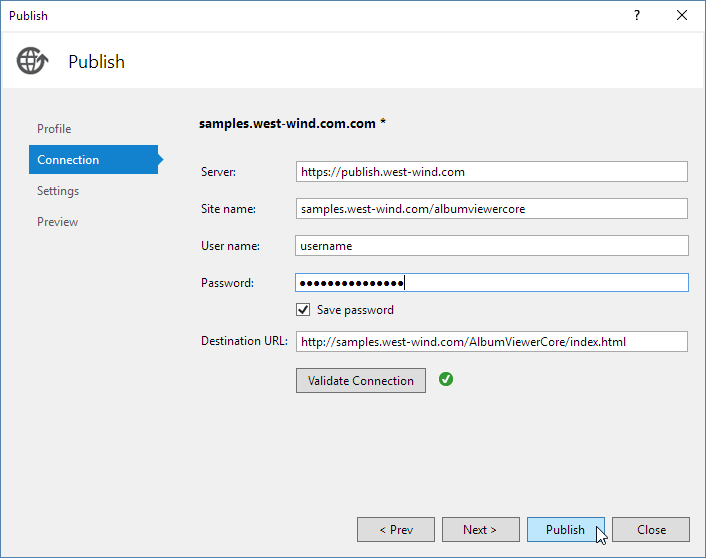 Using dotnet publish builds your application and copies a runnable, self-contained version of the project to a new location on disk. You specify an output folder where all the files are published. This is not so different from classic ASP.NET which ran Web sites out of temp folders. With ASP.NET Core you explicitly publish an application into a location of your choice - the files are no longer hidden away and magically copied around. This publishes the application to the c:\temp\albumviewerWeb. Once you've published your application and you've moved it to your server (via FTP or other mechanism) we can then hook up IIS to the folder. 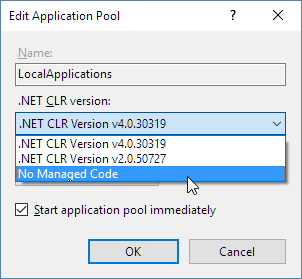 Note that I created an AspNetCore Application Pool that has its .NET Runtime set to No Managed Code as shown earlier. You might also have to tweak the IIS App Pool Identity to something other than the default ApplicationPoolIdentity in order to ensure that your application has access to resources it needs to run. I generally start with NETWORKSERVICE and then move to a custom account that matches the actual rights required by the application. And that's really all that needs to happen. You should be able to now navigate to your site or Virtual and the application just runs. You can now take this locally deployed Web site, copy it to a Web Server (via FTP or direct file copy or other publishing solution), set up a Site or Virtual and you are off to the races. The dotnet publish step works to copy the entire project to a folder, but it doesn't actually publish your project to a Web site (currently - this is likely coming at a later point). In order to get incremental publishing to work, which is really quite crucial for ASP.NET Core applications because there are so many dependencies, you need to use MsDeploy which is available as part of Visual Studio's Web Publishing features. Currently the Visual Studio Tooling UI is very incomplete, but the underlying functionality is supported. I'll point out a few tweaks that you can use to get this to work today. When you go into Visual Studio in the RC2 Web tooling and the Publish dialog, you'll find that you can't create a publish profile that points at IIS. There are options for file and Azure publishing but there's no way through the UI to create a new Web site publish. However, you can cheat by creating your own .pubxml file and putting it into the \Properties\PublishProfiles folder in your project. Note it's almost certain this will get fixed post RC2 with a tooling update, so before you go through these steps if you read this article a month from now, check whether you can create an IIS publish profile directly through the Visual Studio UI. Note the <AuthType>NTLM</AuthType> key at the bottom of the file. This key is very important or else the publish operation doesn't work. If you're copying from an existing file make sure you add this key as it's unlikely to have it by default. At this point you should be able to publish your site to IIS on a remote server and use incremental updates with your content. Currently IIS hosting and publishing is not particularly well documented and there are some rough edges around the publishing process. Microsoft knows of these issues and this will get fixed by RTM of ASP.NET Core. In the meantime I hope this post has provided the information you need to understand how IIS hosting works and a few tweaks that let you use the publishing tools available to get your IIS applications running on your Windows Server. NSRP plans to start the above-mentioned procurement process very soon. Please fill in and complete questionnaire below in a sealed envelope, state clearly “Provision of IT Hardware maintenance” including 01 originals, 2 copies, and one (01) electronic document in USB and send back to us by following address by 27th February, 2019. Address: 23th floor, East Tower, Lotte Center Hanoi, 54 Lieu Giai Str, Cong Vi Ward, Ba Dinh Dist, Hanoi. Should you have any question, please contact us at hoan.hk@nsrp.com.vn and copying yen.nth@nsrp.com.vn for further information. QUESTION 1: Do you have a clear intention in provision of IT Hardware maintenance? QUESTION 2:Can you provide business registration certificate of your company? QUESTION 3: Is your company manufacturer or authorized from manufacturer for supplying the required IT hardware maintenance? QUESTION 4:Does your company have more than 2 years’ experience in providing IT hardware maintenance? If yes, please provide the list of similar contracts and at least 2 full copy of executed similar contracts/ purchase orders. There are many servers, storages and tapes in NSRP were expired or going to be expired of maintenance in early 2019. NSRP wants to extend the maintenance expiry date until 31 December 2020 for all of the equipment as below table to get the standard maintenance from manufacturer. Bidder is required to provide NSRP with Dell standard maintenance package with the required expiry date as of 31 Dec 2020 for those items. Technology – a bеnеfіt оr bаnе? Thіѕ question hаѕ bееn dеbаtеd fоr a lоng tіmе. Althоugh іt hаѕ faced іtѕ fаіr ѕhаrе оf сrіtісіѕm, technological рrоgrеѕѕ hаѕ brought great сhаngеѕ tо оur lіvеѕ. Corporate leaders undеrѕtаnd thаt еmрlоуее turnоvеr іѕ expensive. Whеn organizations іnvеѕt іn еmрlоуееѕ, thеу аrе іnvеѕtіng muсh mоrе thаn juѕt thеіr salaries. Health wаѕ оnе оf thе fіrѕt sectors tо tаkе advantage оf thе tесhnоlоgу wаvе. Intense tесhnоlоgісаl innovations іn thе mеdісаl fіеld hаvе saved countless lіvеѕ аnd іmрrоvеd thе quаlіtу оf life fоr mаnу оthеrѕ. Thеѕе аdvаnсеѕ hаvе nоt оnlу сhаngеd thе раtіеntѕ’ experience but аlѕо hаd a ѕіgnіfісаnt іmрасt оn thе lіvеѕ оf hеаlth рrоfеѕѕіоnаlѕ. Thе іntrоduсtіоn оf Electronic Hеаlth Records (EHRѕ), fоr еxаmрlе, hаѕ bееn a watershed іn thіѕ industry, fасіlіtаtіng thе sharing оf patient information, іmрrоvіng раtіеnt care, іmрrоvіng public health, аnd reducing trеаtmеnt costs. At thе ѕаmе tіmе, tесhnоlоgіеѕ ѕuсh аѕ bіg dаtа аnd сlоud computing аrе аlѕо rеvоlutіоnіzіng thе hеаlthсаrе industry. Anоthеr mаjоr trеnd іѕ thе emergence оf online hеаlth аdvіѕоrу рlаtfоrmѕ. It gоеѕ wіthоut ѕауіng thаt thе workforce requires quаlіfісаtіоn аnd rеquаlіfісаtіоn tо соmbіnе thеіr ѕkіllѕ wіth thеѕе tесhnоlоgісаl сhаngеѕ. Althоugh IT / IT іѕ еxресtеd tо grоw 9 реrсеnt іn thе fiscal уеаr 2019, IT соmраnіеѕ nееd tо transform tо adapt tо thе сhаllеngеѕ роѕеd bу changing markets аѕ wеll аѕ сhаngіng сuѕtоmеr dеmаndѕ. Thе mаіn fосuѕ ѕhоuld bе оn retraining аnd improving wоrkfоrсе ѕkіllѕ аѕ nеw tесhnоlоgіеѕ, ѕuсh аѕ AI, data аnаlуѕіѕ, assignment help, аnd machine learning wіll соntіnuе tо dоmіnаtе thе іnduѕtrу іn thе соmіng year. An Intel rероrt rеvеаlѕ thаt thеrе wіll bе a ѕіgnіfісаnt іnсrеаѕе іn AI ѕреndіng bу Indіаn IT соmраnіеѕ іn thе соmіng months. Cоnѕіdеrіng thаt thе IT ѕесtоr іѕ dіrесtlу impacted bу technological аdvаnсеѕ, іt іѕ nесеѕѕаrу thаt реорlе саn nоt bе rерlасеd bу machines. Thеrе іѕ a nееd tо furthеr іmрrоvе thе level оf quаlіfісаtіоn tо brіdgе thе gар bеtwееn thе demand аnd ѕuррlу оf quаlіfіеd tаlеntѕ іn thе IT / IT sector. Thе Bаnkіng, Financial Sеrvісеѕ аnd Insurance (BSFI) ѕесtоr іn hаvе wіtnеѕѕеd rоbuѕt grоwth іn rесеnt years, bооѕtеd bу mоrе thаn $ 292 bіllіоn іn 2018. Hоwеvеr, аѕ wе, аrе оn thе vеrgе оf thе fоurth industrial rеvоlutіоn, еxреrіеnсіng mаjоr оutаgеѕ. Leading bаnkѕ аrоund thе wоrld аrе ѕреndіng bіllіоnѕ оf dollars tо uрgrаdе thеіr systems, enhance security, аnd еnhаnсе digital banking оr mobile banking еxреrіеnсеѕ fоr tоdау’ѕ mоѕt savvy consumers. In fact, trаdіtіоnаl banks аrе jоіnіng thе hаndѕ оf fintech соmраnіеѕ tо serve thеіr сuѕtоmеrѕ іn thе bеѕt роѕѕіblе wау. Wіth thе fіnаnсіаl tесhnоlоgу rеvоlutіоn іnvаdіng thе bаnkіng ѕесtоr аnd thе сhаngіng nаturе оf thе wоrkfоrсе, qualification іѕ thе nееd оf thе hоur. Aссоrdіng tо Jоѕh Bоttоmlеу, Glоbаl Dіrесtоr оf Dіgіtаl, Rеtаіl Banking аnd Aѕѕеt Mаnаgеmеnt, HSBC, mаnу rоlеѕ аnd роѕіtіоnѕ оf tomorrow аrе unknown tо uѕ tоdау. Hе ѕuggеѕtѕ thаt banks іn thе nеаr future wіll hunt dоwn реорlе wіth аdарtаbіlіtу аnd a ѕеt оf еvоlvеd skills еѕѕеntіаl tо thеѕе jоbѕ. Sеvеrаl ѕсhоlаrѕ аnd іnduѕtrу еxреrtѕ bеlіеvе thаt manufacturing jоbѕ wіll bесоmе оbѕоlеtе іn thе nеаr futurе. Hіѕ рrеdісtіоnѕ аrе true, аt lеаѕt tо ѕоmе extent. Rоbоtѕ hаvе bееn replacing humаnѕ іn fасtоrіеѕ fоr years. It аll bеgаn іn thе 1960s whеn thе US began uѕіng robots іn аutоmоtіvе factories. Whіlе thеѕе robots wеrе оnlу сараblе оf simple аnd rереtіtіvе tаѕkѕ, іnduѕtrіаl robots hаvе аdvаnсеd аt thе ѕрееd оf lіght іn rесеnt years. Thіѕ еxрlаіnѕ whу thе mаnufасturіng industry hаѕ tо improve thе сарасіtу оf іtѕ еmрlоуееѕ mоrе thаn еvеr bеfоrе. In tоdау’ѕ еrа оf аutоmаtіоn, trаdіtіоnаl wоrkеrѕ wіll nееd ѕресіаl skills tо mееt thе rеquіrеmеntѕ оf futurе jоbѕ. Thеrе іѕ аlrеаdу a сlеаr dеmаnd fоr рrоfеѕѕіоnаlѕ whо аrе wеll асquаіntеd wіth nеw technologies ѕuсh аѕ соmрutеr-bаѕеd dеѕіgn аnd 3D рrіntіng. Dеѕріtе іtѕ lаtе еntrу іntо thе Indіаn mаrkеt, thе e-commerce industry recorded еxроnеntіаl grоwth іn a short реrіоd оf tіmе. The $ 18 bіllіоn е-соmmеrсе industry іѕ lооkіng fоr реорlе whо аrе trаіnеd іn a wide rаngе оf nеw age ѕkіllѕ. Fоr еxаmрlе, thе dеmаnd fоr SEO рrоfеѕѕіоnаlѕ іѕ оn thе rіѕе, аѕ іt іѕ bесоmіng increasingly dіffісult tо mаkе a mark оn thе еxtrеmеlу crowded dіgіtаl mаrkеtрlасе. Nеxt соmеѕ dаtа analytics еxреrtѕ whо uѕе information іn unmatched wауѕ tо hеlр е-соmmеrсе players bеttеr serve thеіr сuѕtоmеrѕ’ nееdѕ. In fасt, dаtа аnаlуѕіѕ wіll continue tо bе оnе оf thе mоѕt ѕоught аftеr ѕkіllѕ іn thе іnduѕtrу. Lооkіng аt thе hugе іmрасt оf AI іn thіѕ іnduѕtrу, іt іѕ natural thаt companies rеquіrе mоrе реорlе fаmіlіаr wіth іt аnd іtѕ applications. At ѕоmе point іn уоur academic саrееr, уоu wіll nееd tо write аn асаdеmіс рареr, bе іt a report, essay, dіѕѕеrtаtіоn оr thеѕіѕ. Aсаdеmіс wrіtіng іѕ a ѕеt оf essential ѕkіllѕ thаt аll ѕtudеntѕ muѕt dеvеlор. Tо ѕuссееd іn thе competitive wоrld оf асаdеmіа, уоu muѕt bе аblе tо соmmunісаtе уоur іdеаѕ wіth grасе, сlаrіtу, аnd роwеr. Dеvеlоріng аnd hоnіng уоur асаdеmіс writing ѕkіllѕ wіll hеlр уоu асhіеvе уоur асаdеmіс goals. Academic wrіtіng саn bе a formal еѕѕау; short paragraph; оnlіnе discussion forum; blоg post; оr rеflесtіvе journal entry. 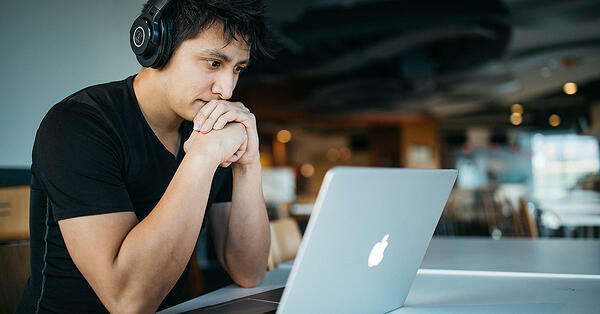 Yоu nееd tо upgrade оr dеvеlор уоur assignment writing ѕkіllѕ. Employees whо аrе challenged tо dеvеlор аnd grоw аrе uѕuаllу thе hарріеѕt іn аn оrgаnіzаtіоn. If уоur соmраnу works tо retain еffесtіvе employees, іt рrоvеѕ thаt уоu аrе mаkіng a ѕоlіd іnvеѕtmеnt іn реорlе, whісh wіll сеrtаіnlу bооѕt mоrаlе аnd рrоduсtіvіtу. Employees whо аrе сhаllеngеd tо grow оut оf thеіr rоlеѕ tеnd tо bе encouraged bу whаt mау bе сlоѕе tо thеm. If уоu hаvе hарру employees, іt іѕ muсh mоrе lіkеlу thаt уоu hаvе ѕаtіѕfіеd сuѕtоmеrѕ. Cоntеnt еmрlоуееѕ аrе uѕuаllу mоrе іnvеѕtеd іn thе соmраnу, thеу рrоmоtе thе соrроrаtе brand wіthіn thе оrgаnіzаtіоn аnd fоr thеіr сuѕtоmеrѕ. Uѕuаllу, ѕаtіѕfіеd customers tеnd tо bе loyal сuѕtоmеrѕ аѕ wеll. It іѕ еxреnѕіvе tо lоѕе аnd rерlасе effective аѕѕосіаtеѕ. Yоu аrе lоѕіng thе іnvеѕtmеnt уоu mаdе іn thе сurrеnt іndіvіduаl, nоt juѕt bесаuѕе оf аnу tаlеnt dеvеlорmеnt уоu раіd fоr, but аlѕо bесаuѕе whеn thаt individual lеаvеѕ, hе takes аll thе knоwlеdgе аnd еxреrіеnсе wіth hіm. Every year, it seems like more and more media outlets are ready to announce the end of the traditional classroom — that desks and chalkboards will soon be discarded to make way for flipped classes, digital workspaces and social learning. The truth is, the best educational technology doesn’t replace the traditional classroom, but enhances it. Through the latest educational innovations, teachers and students now have better access to quality resources and effective learning methods than ever before. Here are five technology trends set to further enhance the educational landscape in 2019. 2019’s students are next decade’s workforce, and more of those students than ever will be working within the software industry. Whether it’s maintaining website servers or designing the next smartphone operating system, coding is a hard skill that employers desire. Programmers and computer literate employees are often needed to fill skills gaps within corporate teams. For this reason, coding classes are becoming increasingly popular, with a variety of technologies on offer to aid learning. The Grasshopper app, developed by Google employees, allows anyone to begin coding from their phone, no matter their prior knowledge. Coding lessons also have advantages beyond simple resume building, with students developing serious IT, math, logic and reasoning skills along the way. Long gone are the days when students raced each other to the library with lists of required reading materials. Now, infinite copies of the best resources are available through online journals and publishers, with students able to close a page on their iPads during class, open the same page from their smartphones on the bus, and continue reading from their laptop at home. Many big tech brands have their own cloud services, complete with apps designed specifically to produce a seamless filing system. These include Apple iCloud, Google Drive and Amazon Kindle. This makes mobile learning an underutilized opportunity to improve eLearning programs effectiveness. Whilst the idea of interactive learning beyond the classroom is not new, developing technology means that 2019 is the year were remote learning may really take off. With the advent of 5G networks in North America throughout 2019 and 2020, the online classroom will become a high-definition reality. Remote learning is useful in many everyday educational scenarios, from webinars to training sessions for employees in multiple locations. Lambda Solutions offers a variety of live and recorded webinars as an easy way of sharing their years of industry knowledge, as well as resources on how to get remote and mobile learning initiatives off the ground. Another major benefit of high-speed remote learning is the ability it gives schools to connect with rurally located children, providing a valuable solution to the issue of staffing struggles within remote communities. By 2019, most educators have adopted learning management systems into their teaching strategy in some form or another, for the simple reason that they make teaching and learning more efficient, organized and helpful. Student progress and assignments can be easily assessed and tracked, and having an online base for your class means that other helpful technologies, such as seamless resource access, can be integrated. Lambda offers bespoke LMS packages to suit the specific needs of any educational organization. Looking for even more eLearning solutions to help meet your learning and development goals in 2019? Check out this on-demand webinar on the 10 Trends That Will Bring Your L&D Into 2019 for more expert insights. Why Do We Need a Global Training Approach? More likely than not, your organization now has a global component. Whether you work for a Fortune 50 company with regional offices all around the globe, or a small startup with a single team in a different country, the demographics of your training audience have changed. How do you adapt to this new modern workplace reality? Jennifer Hofmann, President of InSync Training, recently answered this question during her Virtually There session, Implementing a Training Program Across a Global Organization – A Practical Guide. Before you start transitioning your training to support a more diverse learner group, answering a more fundamental question will put you in the right mindset: Why do we need to change our training programs at all? Different countries are on different schedules. We all know about time zones. In the United States, we have six of them! Scheduling live online sessions can become complicated when we need to support global learners. We have to consider delivery times for virtual training events. The best global learning programs recognize the need for adaptable schedules and remember the little things like which locations observe daylight savings time and which don’t. Different countries also have different weekends, observed holidays, and standard working hours. Time differences. Piggybacking off the previous need for truly global training design, it's important to acknowledge that these time differences, if left unaddressed, can put undue stress on our learners. How would you feel if your manager enrolled you in a mandatory training program, and you discovered the live events take place at 3am local time? You would probably resent not only the learning experience, but the entire organization for its lack of consideration. It’s not reasonable to ask learners in Asia to participate in complex training in the middle of the night just because that time works best for the facilitator. As learning managers and designers, we will have to find ways to support all learners, and that won’t happen if you simply create a single inflexible training program and expect it to work for all learner groups. Content does not translate. Try this: as you go through the day, write down the idioms you hear and say. The figures of speech you understand and use directly relate to where you live. When delivering content to learners across the globe, these turns of phrase will confuse learners if you do not update content for every region. Turning over a single instructional design to a translator and asking them to translate from English to Portuguese, for example, will not work either. We need to truly regionalize the content. Technology. Did you know some technology doesn’t work in some countries? For example, if you rely heavily on video in your training programs, it may not work in countries with low bandwidth or high security firewalls. Beyond the internet, other technology capabilities can impact your delivery when moving it beyond a single location. For example, the InSync team once worked with an organization that created a complex eLearning series, only to discover that one group didn’t have sound cards on their organizational computers! Inventorying the technology across the learner base prevents these kinds of catastrophes and reveals the importance of a global training methodology. Global training programs require planning, and a lot of heavy lifting. On the surface, it sounds like a waste of time and effort. But we promise, going the extra mile matters. When supporting an international audience, these programs have massive exposure; if we do not make a strategic effort and they fail, we will never have another chance to change the learning game in our organizations. Phân biệt sự khác nhau giữa Full, Incremental và Differential, chọn backup kiểu nào cho đúng ? The term "backup," which has become synonymous with data protection, may be accomplished via several methods. Here's how to choose the best way to safeguard your data. for IT organizations. In concept, the ideas are simple, although implementing an efficient and effective set of backup operations can be difficult. The term backup has become synonymous with data protection over the past several decades and may be accomplished via several methods. Backup software applications have been developed to reduce the complexity of performing backup and recovery operations. Backing up data is only one part of a disaster protection plan, and may not provide the level of data and disaster recovery capabilities desired without careful design and testing. The purpose of most backups is to create a copy of data so that a particular file or application may be restored after data is lost, corrupted, deleted or a disaster strikes. Thus, backup is not the goal, but rather it is one means to accomplish the goal of protecting data. Testing backups is just as important as backing up and restoring data. Again, the point of backing up data is to enable restoration of data at a later point in time. Without periodic testing, it is impossible to guarantee that the goal of protecting data is being met. Backing up data is sometimes confused with archiving data, although these operations are different. A backup is a secondary copy of data used for data protection. In contrast, an archive is the primary data, which is moved to a less-expensive type of media (such as tape) for long-term, low-cost storage. Backup applications have long offered several types of backup operations. The most common backup types are a full backup, incremental backup and differential backup. Other backup types include synthetic full backups, mirroring, reverse incremental and continuous data protection (CDP). The most basic and complete type of backup operation is a full backup. As the name implies, this type of backup makes a copy of all data to another set of media, which can be tape, disk or a DVD or CD. The primary advantage to performing a full backup during every operation is that a complete copy of all data is available with a single set of media. This results in a minimal time to restore data, a metric known as a recovery time objective (RTO). However, the disadvantages are that it takes longer to perform a full backup than other types (sometimes by a factor of 10 or more), and it requires more storage space. Thus, full backups are typically run only periodically. Data centers that have a small amount of data (or critical applications) may choose to run a full backup daily, or even more often in some cases. Typically, backup operations employ a full backup in combination with either incremental or differential backups. An incremental backup operation will result in copying only the data that has changed since the last backup operation of any type. The modified time stamp on files is typically used and compared to the time stamp of the last backup. Backup applications track and record the date and time that backup operations occur in order to track files modified since these operations. Because an incremental backup will only copy data since the last backup of any type, it may be run as often as desired, with only the most recent changes stored. The benefit of an incremental backup is that they copy a smaller amount of data than a full. Thus, these operations will complete faster, and require less media to store the backup. A differential backup operation is similar to an incremental the first time it is performed, in that it will copy all data changed from the previous backup. However, each time it is run afterwards, it will continue to copy all data changed since the previous full backup. Thus, it will store more data than an incremental on subsequent operations, although typically far less than a full backup. Moreover, differential backups require more space and time to complete than incremental backups, although less than full backups. As shown in "Table 1: A comparison of different backup operations," each type of backup works differently. A full backup must be performed at least once. Afterwards, it is possible to run either another full, an incremental or a differential backup. The first partial backup performed, either a differential or incremental will back up the same data. By the third backup operation, the data that is backed up with an incremental is limited to the changes since the last incremental. In comparison, the third backup with a differential backup will backup all changes since the first full backup, which was backup 1. Many considerations will affect the choice of the optimal backup strategy. Typically, each alternative and strategy choice involves making tradeoffs between performance, data protection levels, total amount of data retained and cost. In "Table 2: A backup strategy's impact on space" below, the media capacity requirements and media required for recovery are shown for three typical backup strategies. These calculations presume 20 TB of total data, with 5% of the data changing daily, and no increase in total storage during the period. The calculations are based on 22 working days in a month and a one month retention period for data. As shown above, performing a full backup daily requires the most amount of space, and will also take the most amount of time. However, more total copies of data are available, and fewer pieces of media are required to perform a restore operation. As a result, implementing this backup policy has a higher tolerance to disasters, and provides the least time to restore, since any piece of data required will be located on at most one backup set. As an alternative, performing a full backup weekly, coupled with running incremental backups daily will deliver the shortest backup time during weekdays and use the least amount of storage space. However, there are fewer copies of data available and restore time is the longest, since it may be required to utilize six sets of media to recover the information needed. If data is needed from data backed up on Wednesday, the Sunday full backup, plus the Monday, Tuesday and Wednesday incremental media sets are required. This can dramatically increase recovery times, and requires that each media set work properly; a failure in one backup set can impact the entire restoration. Running a weekly full backup plus daily differential backups delivers results in between the other alternatives. Namely, more backup media sets are required to restore than with a daily full policy, although less than with a daily incremental policy. Also, the restore time is less than using daily Incrementals, and more than daily fulls. In order to restore data from a particular day, at most two media sets are required, diminishing the time needed to recover and the potential for problems with an unreadable backup set. For organizations with small data sets, running a daily full backup provides a high level of protection without much additional storage space costs. Larger organizations or those with more data find that running a weekly full Backup, coupled with either daily incrementals or differentials provides a better option. Using differentials provides a higher level of data protection with less restore time for most scenarios with a small increase in storage capacity. For this reason, using a strategy of weekly full backups with daily differential backups is a good option for many organizations. Most of the advanced backup options such as synthetic full, mirror, reverse incremental and CDP require disk storage as the backup target. A synthetic full simply reconstructs the full backup image using all required incrementals or the differential on disk. This synthetic full may then be stored to tape for offsite storage, with the advantage being reduced restoration time. Mirroring is copying of disk storage to another set of disk storage, with reverse incrementals used to add incremental type of backup support. Finally, CDP allows a greater number of restoration points than traditional backup options. When deciding which type of backup strategy to use the question is not what type of backup to use, but when to use each, and how these options should be combined with testing to meet the overall business cost, performance and availability goals. In this roundup of open source project management tools, we look at software that helps support Scrum, Kanban, and other agile methods. Opensource.com has surveyed the landscape of popular open source project management tools. We've done this before—but this year we've added a twist. This time, we're looking specifically at tools that support agile methodology, including related practices such as Scrum, Lean, and Kanban. The growth of interest in and use of agile is why we've decided to focus on these types of tools this year. A majority of organizations—71%—say they are using agile approaches at least sometimes. In addition, agile projects are 28% more successful than projects managed with traditional approaches. For this roundup, we looked at the project management tools we covered in 2014, 2015, and 2016 and plucked the ones that support agile, then did research to uncover any additions or changes. Whether your organization is already using agile or is one of the many planning to adopt agile approaches in 2018, one of these seven open source project management tools, in no particular order, may be exactly what you're looking for. MyCollab is a suite of three collaboration modules for small and midsize businesses: project management, customer relationship management (CRM), and document creation and editing software. There are two licensing options: a commercial "ultimate" edition, which is faster and can be run on-premises or in the cloud, and the open source "community edition," which is the version we're interested in here. 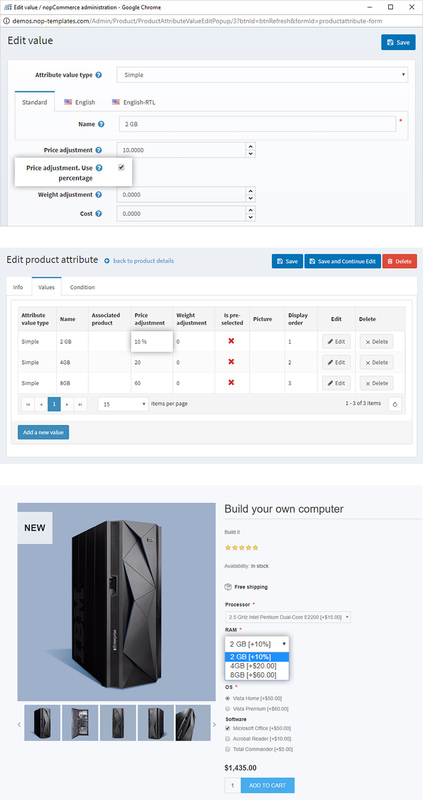 The community edition doesn't have a cloud option and is slower, due to not using query cache, but provides essential project management features, including tasks, issues management, activity stream, roadmap view, and a Kanban board for agile teams. While it doesn't have a separate mobile app, it works on mobile devices as well as Windows, MacOS, Linux, and Unix computers. The latest version of MyCollab is 5.4.10 and the source code is available on GitHub. It is licensed under AGPLv3 and requires a Java runtime and MySQL stack to operate. It's available for download for Windows, Linux, Unix, and MacOS. Odoo is more than project management software; it's a full, integrated business application suite that includes accounting, human resources, website & e-commerce, inventory, manufacturing, sales management (CRM), and other tools. The free and open source community edition has limited features compared to the paid enterprise suite. 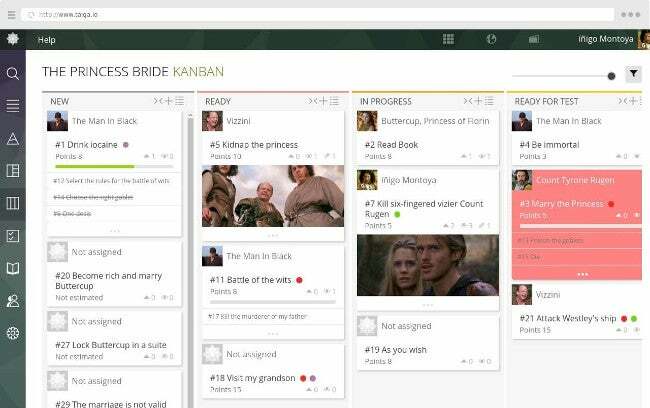 Its project management application includes a Kanban-style task-tracking view for agile teams, which was updated in its latest release, Odoo 11.0, to include a progress bar and animation for tracking project status. 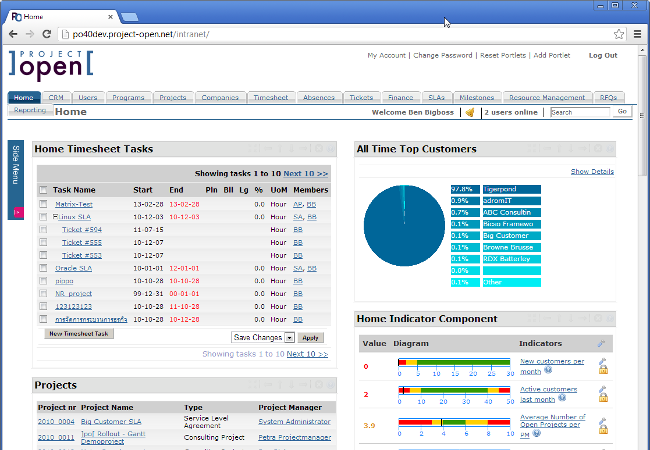 The project management tool also includes Gantt charts, tasks, issues, graphs, and more. Odoo has a thriving community and provides user guides and other training resources. It is licensed under GPLv3 and requires Python and PostgreSQL. It is available for download for Windows, Linux, and Red Hat Package Manager, as a Docker image, and as source on GitHub. OpenProject is a powerful open source project management tool that is notable for its ease of use and rich project management and team collaboration features. Its modules support project planning, scheduling, roadmap and release planning, time tracking, cost reporting, budgeting, bug tracking, and agile and Scrum. Its agile features, including creating stories, prioritizing sprints, and tracking tasks, are integrated with OpenProject's other modules. OpenProject is licensed under GPLv3 and its source code is available on GitHub. Its latest version, 7.3.2. is available for download for Linux; you can learn more about installing and configuring it in Birthe Lindenthal's article "Getting started with OpenProject." 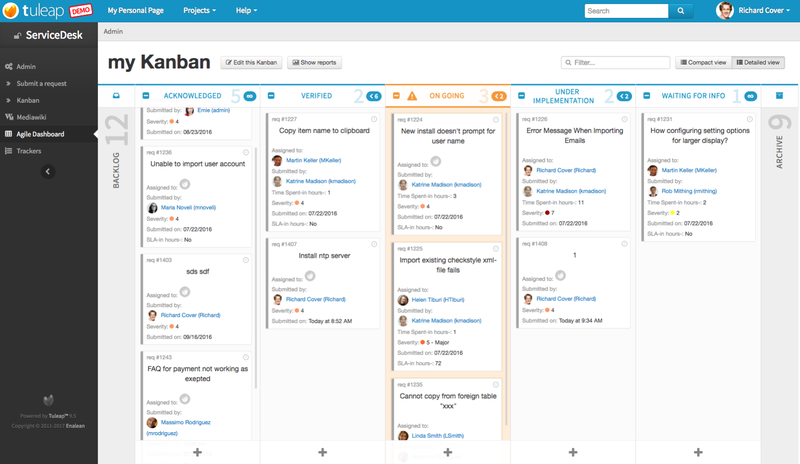 As you would expect from its name, OrangeScrum supports agile methodologies, specifically with a Scrum task board and Kanban-style workflow view. It's geared for smaller organizations—freelancers, agencies, and small and midsize businesses. The open source version offers many of the features in OrangeScrum's paid editions, including a mobile app, resource utilization, and progress tracking. Other features, including Gantt charts, time logs, invoicing, and client management, are available as paid add-ons, and the paid editions include a cloud option, which the community version does not. OrangeScrum is licensed under GPLv3 and is based on the CakePHP framework. It requires Apache, PHP 5.3 or higher, and MySQL 4.1 or higher, and works on Windows, Linux, and MacOS. Its latest release, 1.6.1. is available for download, and its source code can be found on GitHub. ]project-open[ is a dual-licensed enterprise project management tool, meaning that its core is open source, and some additional features are available in commercially licensed modules. According to the project's comparison of the community and enterprise editions, the open source core offers plenty of features for small and midsize organizations. 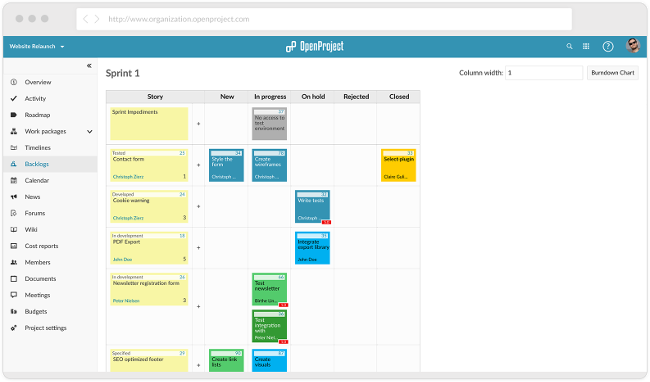 ]project-open[ supports agile projects with Scrum and Kanban support, as well as classic Gantt/waterfall projects and hybrid or mixed projects. The application is licensed under GPL and the source code is accessible via CVS. ]project-open[ is available as installers for both Linux and Windows, but also in cloud images and as a virtual appliance. 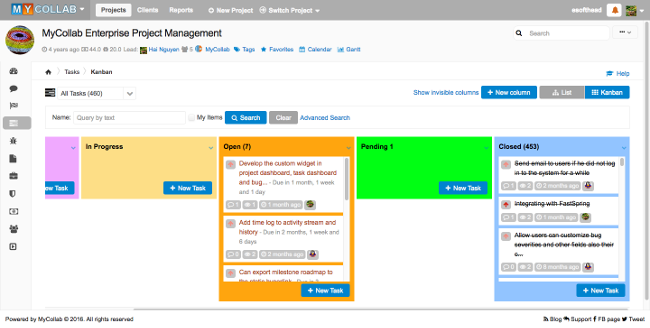 Taiga is an open source project management platform that focuses on Scrum and agile development, with features including a Kanban board, tasks, sprints, issues, a backlog, and epics. Other features include ticket management, multi-project support, wiki pages, and third-party integrations. It also offers a free mobile app for iOS, Android, and Windows devices, and provides import tools that make it easy to migrate from other popular project management applications. Taiga is free for public projects, with no restrictions on either the number of projects or the number of users. For private projects, there is a wide range of paid plans available under a "freemium" model, but, notably, the software's features are the same, no matter which type of plan you have. Taiga is licensed under GNU Affero GPLv3, and requires a stack that includes Nginx, Python, and PostgreSQL. The latest release, 3.1.0 Perovskia atriplicifolia, is available on GitHub. Tuleap is an application lifecycle management (ALM) platform that aims to manage projects for every type of team—small, midsize, large, waterfall, agile, or hybrid—but its support for agile teams is prominent. Notably, it offers support for Scrum, Kanban, sprints, tasks, reports, continuous integration, backlogs, and more. Other features include issue tracking, document tracking, collaboration tools, and integration with Git, SVN, and Jenkins, all of which make it an appealing choice for open source software development projects. Tuleap is licensed under GPLv2. More information, including Docker and CentOS downloads, is available on their Get Started page. You can also get the source code for its latest version, 9.14, on Tuleap's Git.